I was just east of Cleveland when I hit up a rest stop to take a break and got some exercise. By the time I was done, it was 5PM. I looked at the map and realized Ohio is another deceptively big state. If I wanted to make it inside the Indiana border before it was too late, I’d have to get moving. As you can see from the miles covered above, I certainly got moving and far too late into the night (most miles in one day so far on this journey). I’ll have to return to Cleveland sometime to see both of their buildings. Thanks to my buddy Matt for a recommendation to get a burger from Swenson’s Drive-In in Akron. Great burger…not sure if it’s deserving of the advertised “Best Burgers in the US” label, but it was definitely tasty. Great shakes, too. Continued in a southwest direction from there, eventually crossing the Indiana border late in the night. Didn’t take many photos of note during the drive, but I was happy to make big progress on this portion of the trip. I was thinking of pulling out the camera late at night in Indiana farm country to catch some stars, but a waning gibbous moon was a bit too prominent in the night sky. No worries. By the time I’m out in the desert, the light from the moon will not be a factor, and I’ll be sure to catch a large amount of stars. 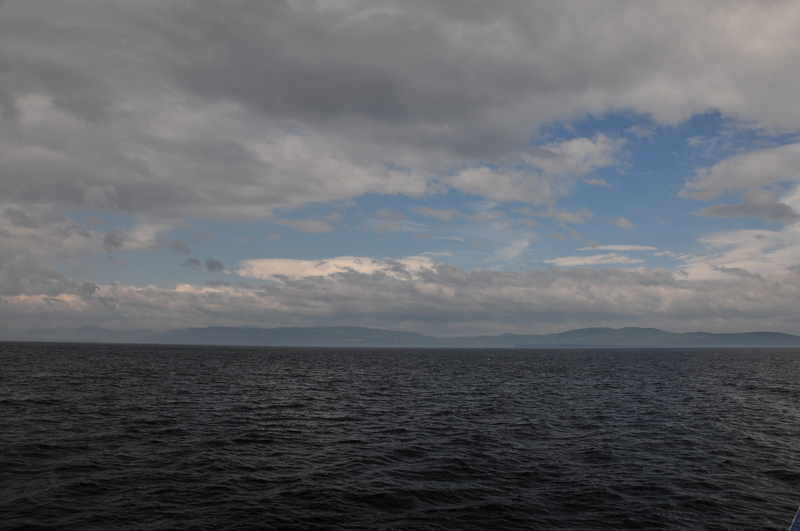 Woke up early to a rainy day in Burlington, and it was a little bit of a bummer since the plan was to take the hour-long ferry ride from Burlington, VT to Fort Kent, NY across the enormous Lake Champlain, and I was hopeful for some clear skies during the ride. Made my way to the port and paid the $17 fee to get my car across. I was early, so after lining up my car I took a nap, and sure enough I awoke to my car being the only one remaining in the original queue. I gave the clerk my ticket and was the last one onboard. 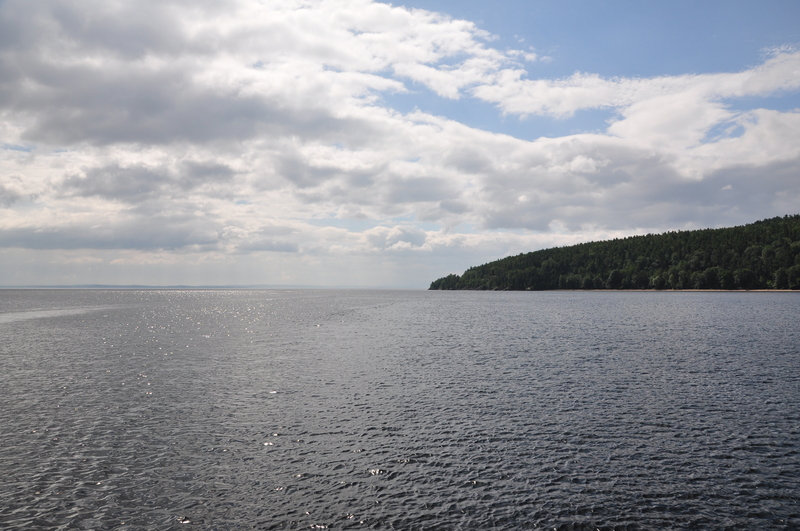 The ship departed promptly at 8:50AM and we got moving on some calm waters. 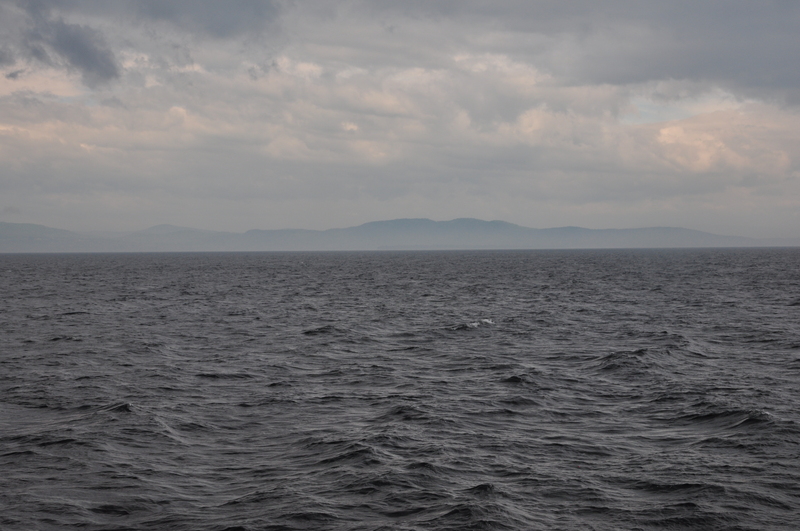 I didn’t think we were going very fast, but once I went downstairs to the galley area and looked out a porthole, I realized how fast we were actually moving. The ride was really pleasant. 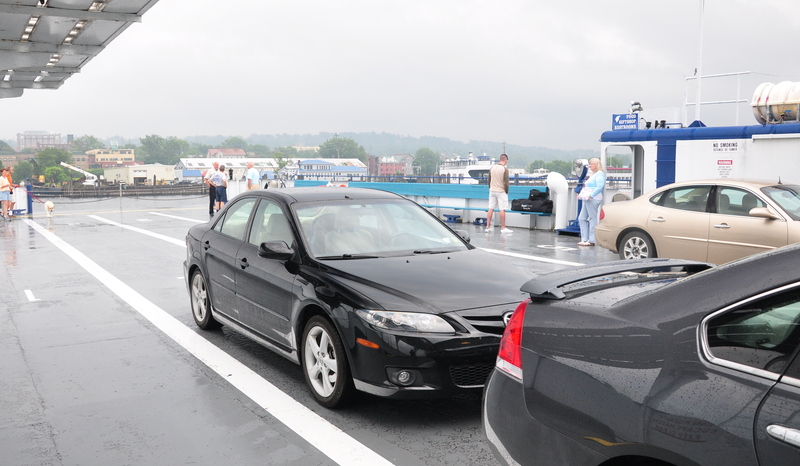 I think I’ve only taken one ferry before, and that was just me on and my feet (no car) going from Cape May, NJ to Rehoboth Beach, DE, and I had little memory of that outside of falling asleep on a bench. I liked how passengers are free to walk around the ship and enjoy the sights. There were no sightings of Champ, but it was still memorable. 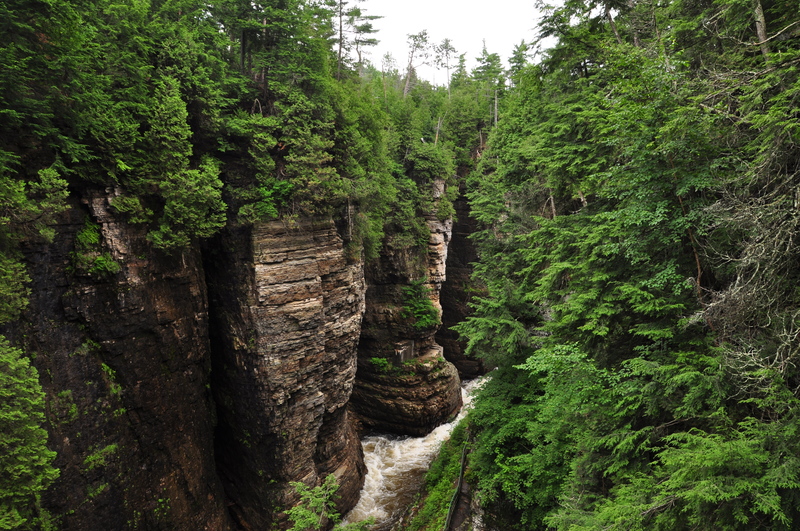 I wouldn’t exactly describe it as Grand Canyon-esque, but it was still an interesting gorge to walk through. 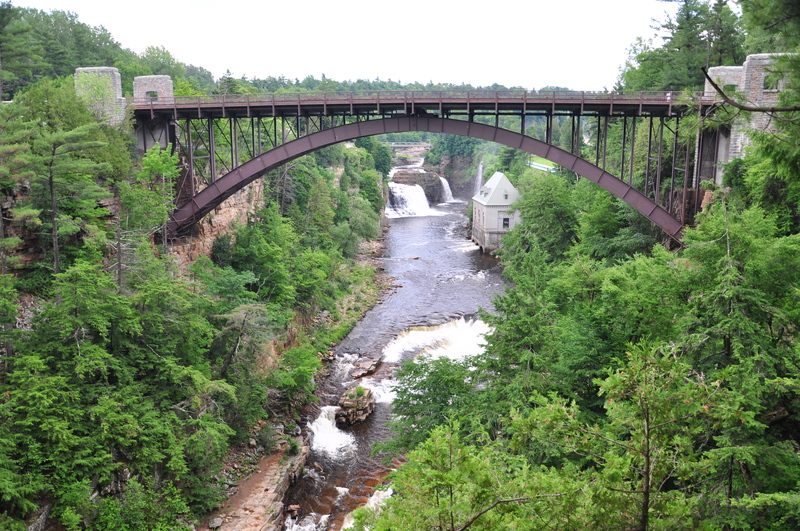 I had no idea about this place, and I grew up in NY. 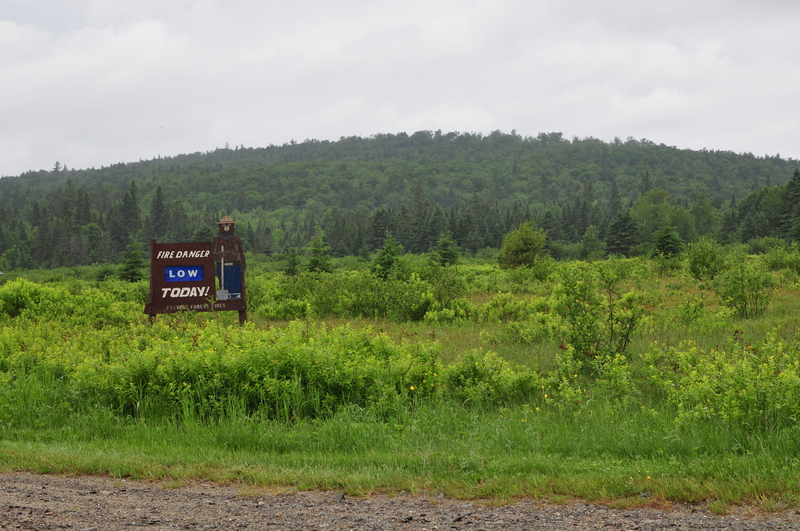 It was around $16 to get admission to do a self-guided hike, and I was initially reluctant, but after the hike I was happy I decided to go for it. Cool place. 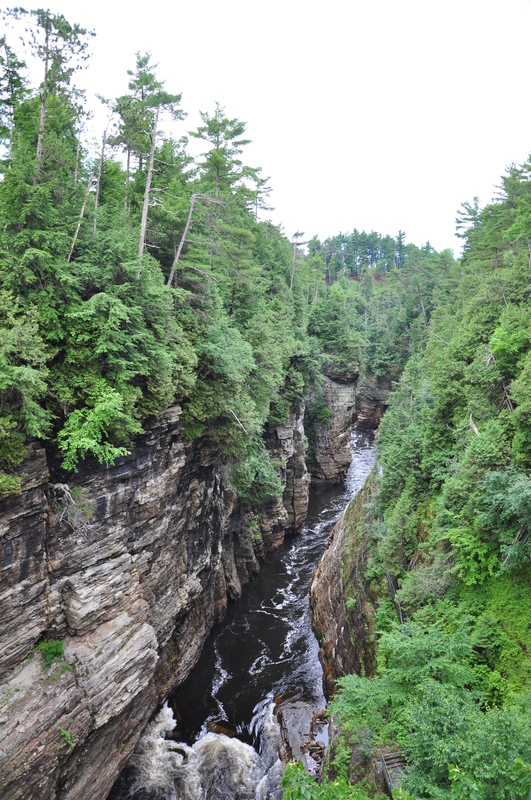 It was probably about an hour and half I spent walking amongst the different sections of the chasm. When done, and sweaty as hell, I grabbed a quick bite and got back in the car to continue west. 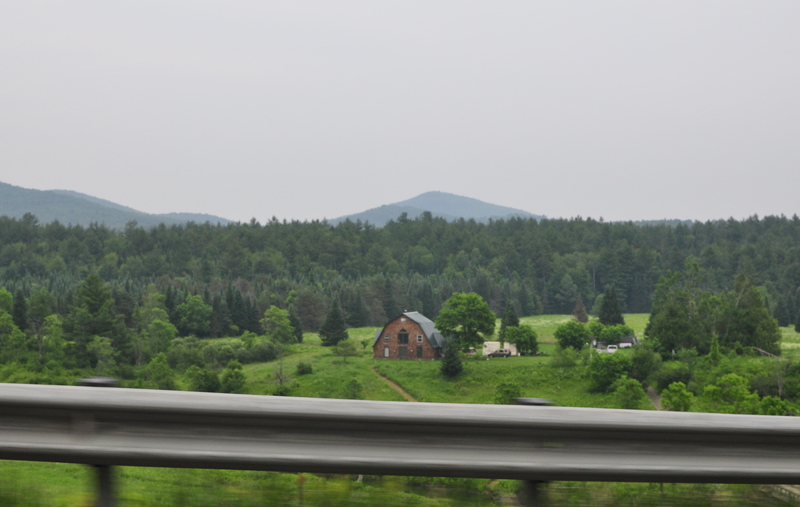 The drive through the Adirondack mountains was quite scenic. 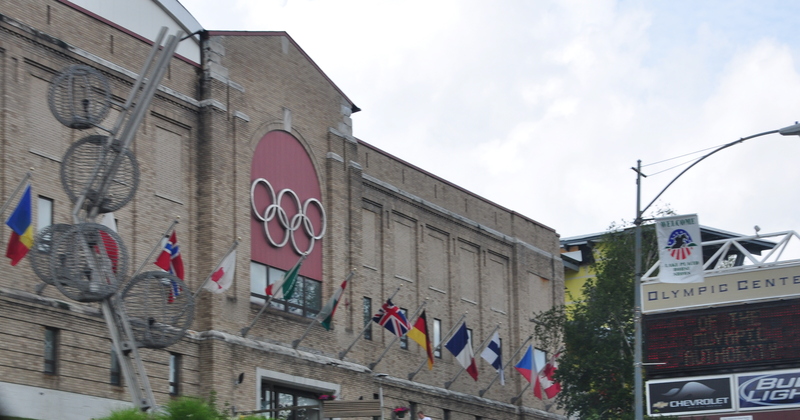 The drive took me through Lake Placid – home of the 1980 Winter Olympics and the “Miracle on Ice.” Very nice-looking town. 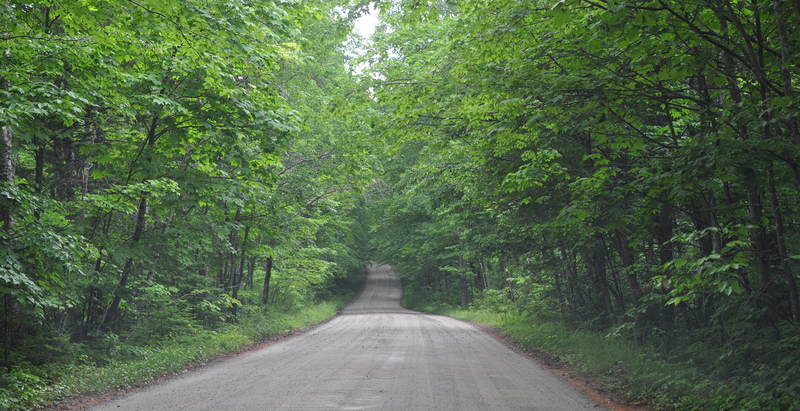 I continued on and eventually found my way to the northern stretch of I-81, near Watertown. 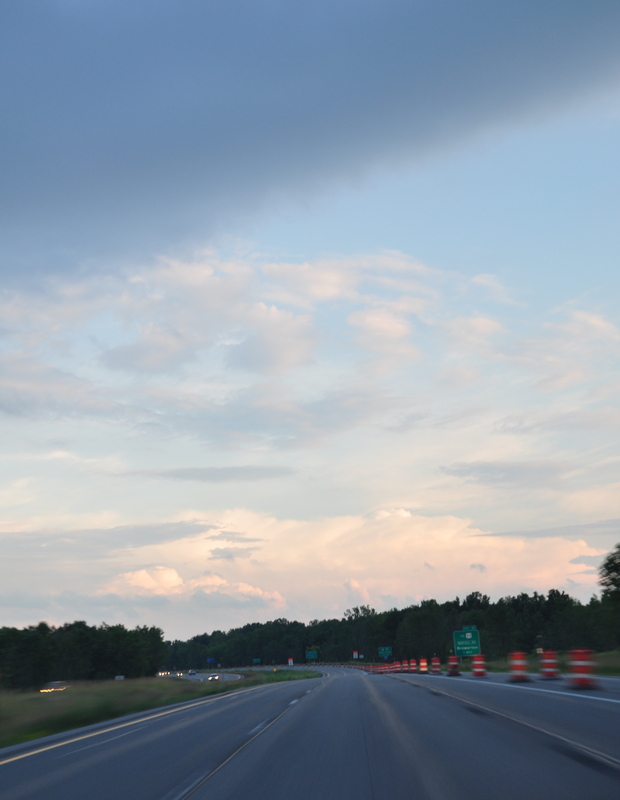 Worked my way south to the Syracuse area, then linked up with I-90W towards Rochester. Turned out to be great timing, as the sun was coming down just as I was getting onto I-90. 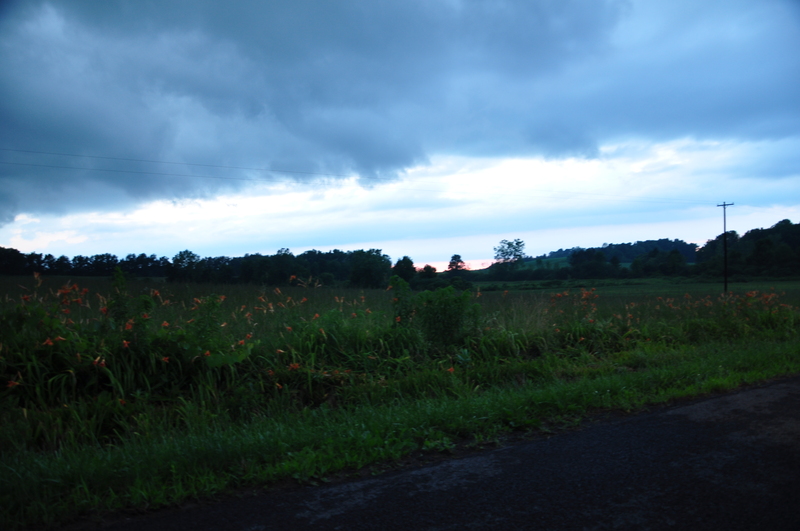 Drove on some local roads for a little bit, and got to check out some farm country in the Finger Lakes region. Tomorrow will be another big day of driving, as I plan to get to Ohio at some point in the afternoon. Depending on the weather, I may be able to check out some outdoor attractions down that way. 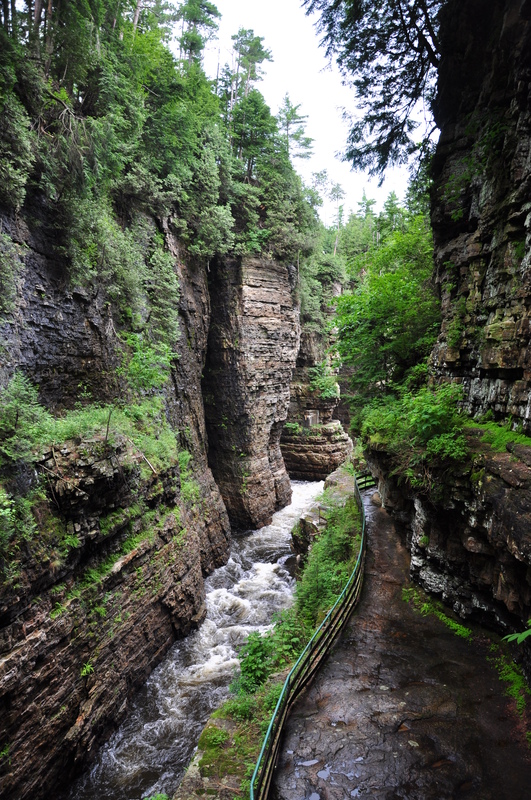 NY is a huge state to drive through, but it’s hard to beat the views. Before you read this, be sure to get caught up with the last few items I’ve written. There’s been several posts in the past 48 hours. At this point, I suppose it’s safe to say the “first phase” of my trip is complete. This was the map I initially drew up as a rough plan for my trip, and the blue line shows my starting point in Acworth, GA, taking me all the way up to Maine. From there, following the red line, you can see the route turns West (aka the second phase of the trip). I started that part today. So here’s a map I drew showing the route I took (following interstates and highways as best as I could freehand) from the starting point, May 30, through June 26. You may have noticed I’ve covered over 5,000 miles at this point, 29 days into the trip. 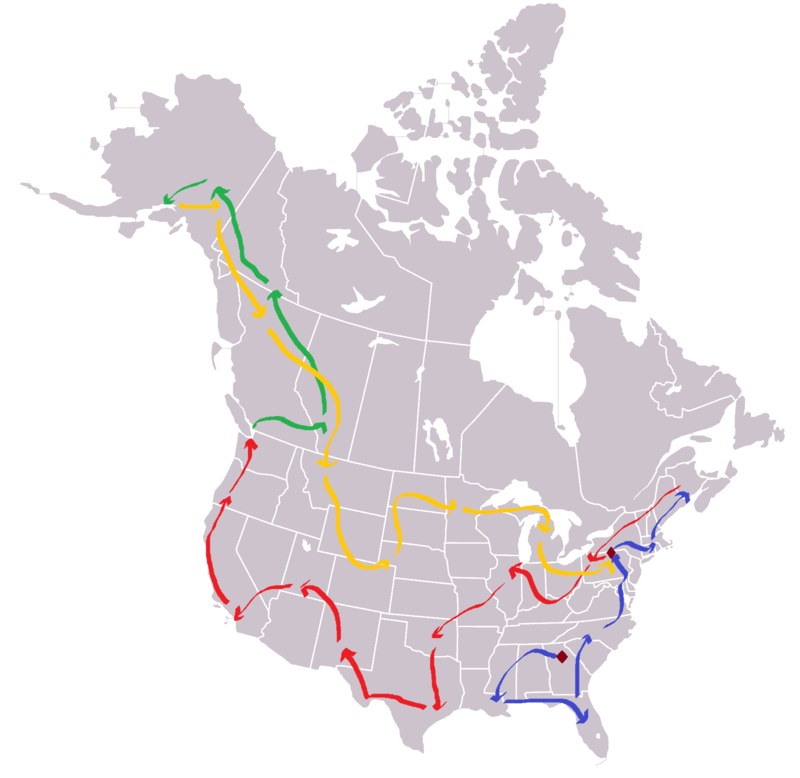 As a point of comparison, back in my 2005 roadtrip, I did a big loop around the country and covered about 12,000 miles in the same amount of time. That was a definite whirlwind, so I’m glad this time I got to take my time coming up North, seeing friends and family along the way. As I travel further West, the number of friends and family I know decreases a fair amount, so I imagine I’ll be covering more ground in that portion of the trip (red arrow in first map above), in a shorter amount of time. Thanks for following me along so far. Everyone’s words of support have meant a lot. Hope you stay tuned – there is a lot more of the US and Canada to see yet! Took care of laundry and some other business at Colleen’s in the morning, then hit the road shortly before 1PM and made my way Northwest. The plan was to get to Burlington, VT by the end of the day. 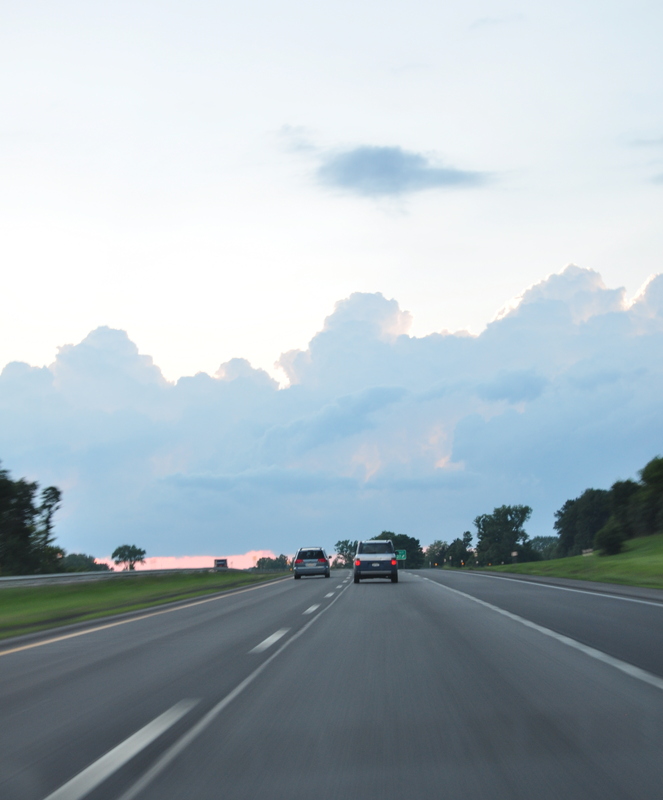 On paper, it was a five hour drive, but I spent a lot of time on state highways that, though scenic, moved fairly slow. 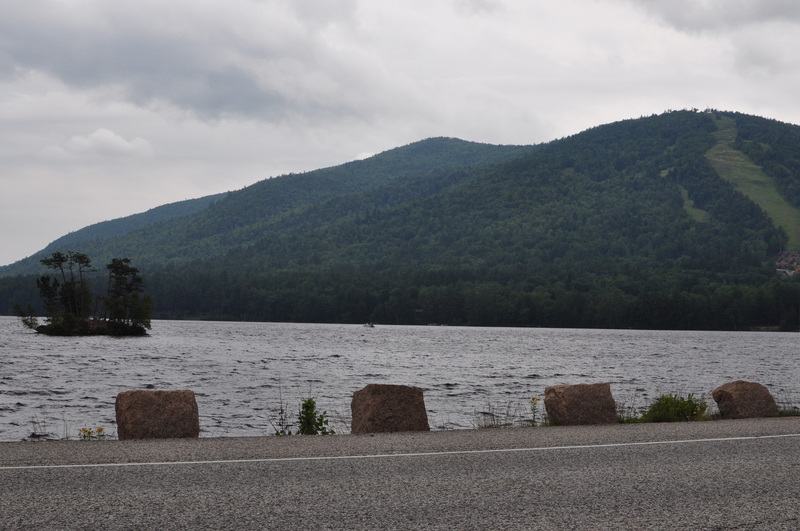 I’m glad I had the chance to take this route as New Hampshire and Vermont are both incredibly scenic states. 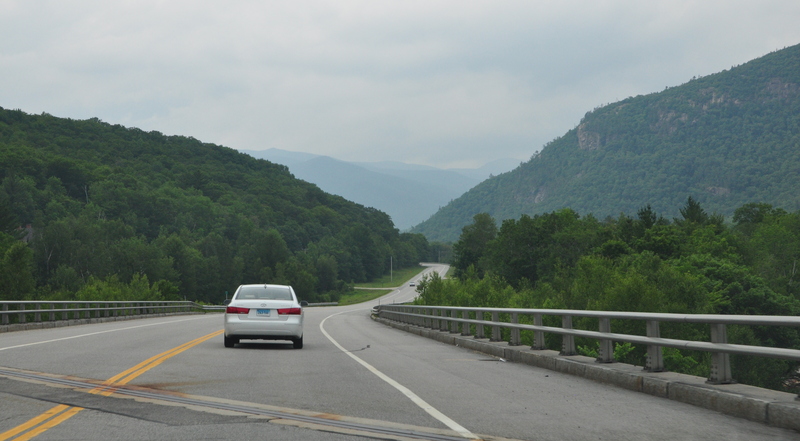 I got to drive through the White Mountains of New Hampshire and learned why Vermont is called the “Green Mountain State.” I was debating taking time out to do some hiking, but I wanted to get to Burlington before it was too late, so I passed. Worked out, as for parts of the way it was raining. 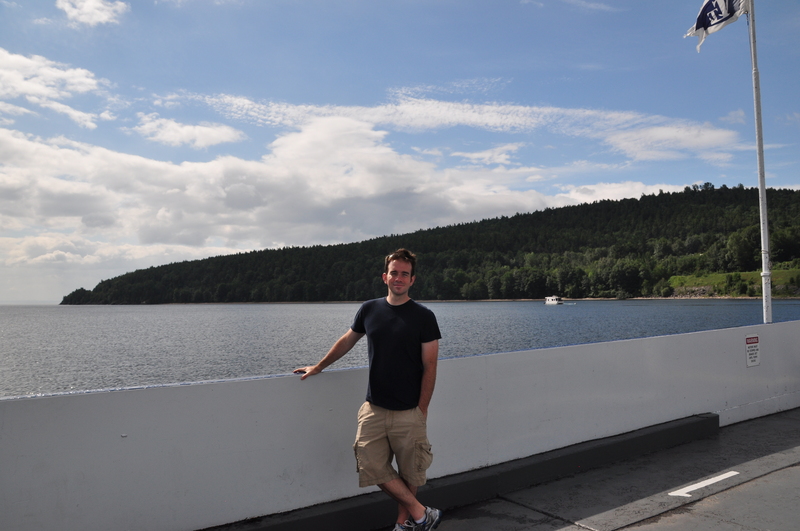 So thanks to my friend John for bringing up the ferry options available at Lake Champlain, which is on the Northern border of NY and VT. 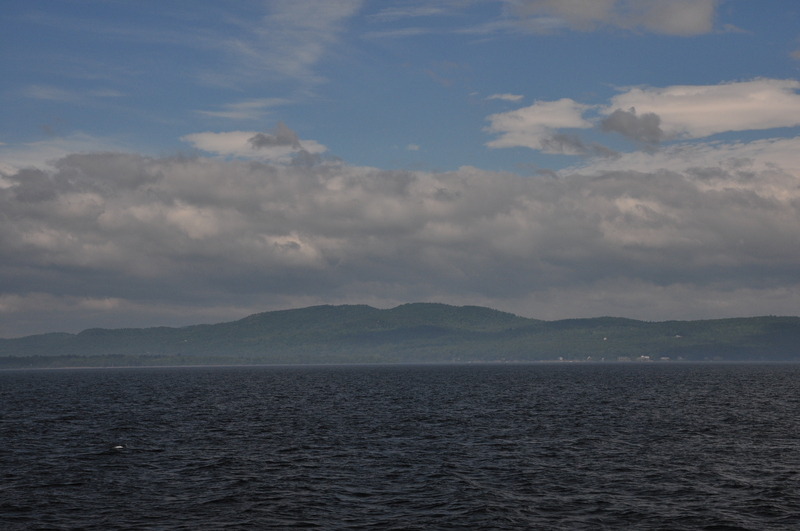 I had no idea Lake Champlain was so huge until I took a detailed look at the map. One could drive around north or south, but it would be quite a detour, and I’ve heard the ferry trip is a nice ride (and not too expensive) so I’ll do that tomorrow morning and be back in my home state of NY; however, it will be unfamiliar territory for me, as I don’t think I’ve ever been that far north in the state. All the more reason to explore it. 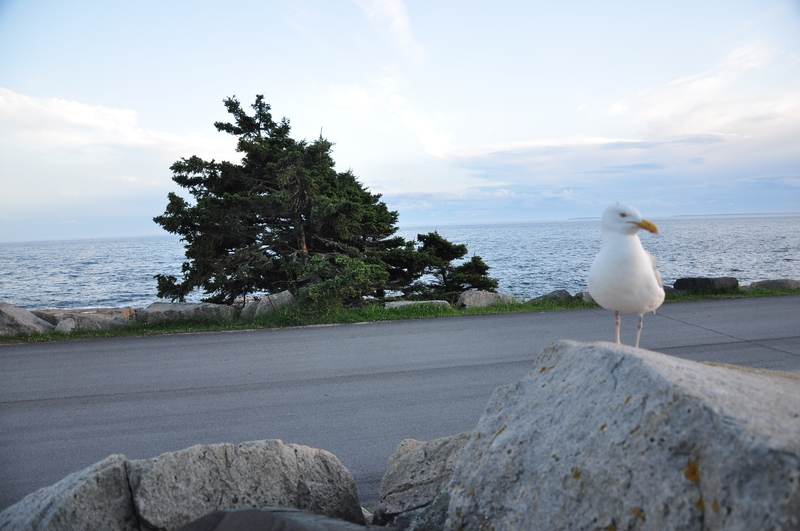 In Bar Harbor, I was having a spotty connection on my phone – phone calls were not going through, and I was having difficulty getting on the Internet. 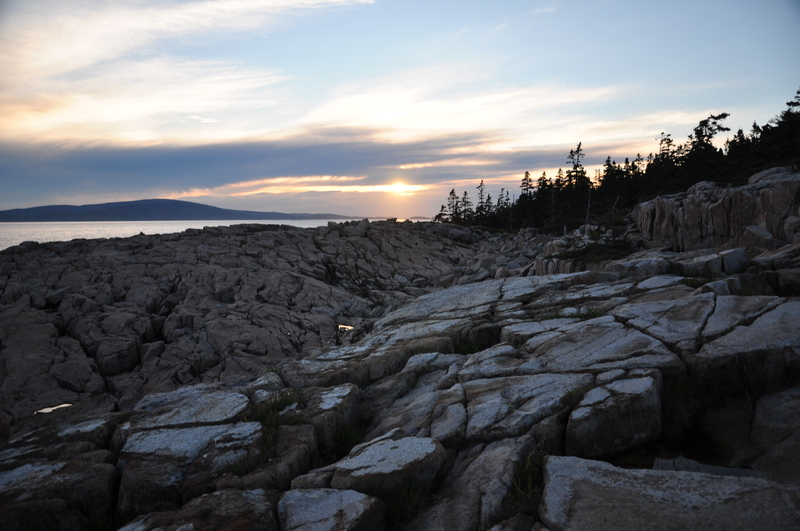 I was curious as to when the sun was rising so I could be on top of Cadillac Mountain in Acadia National Park in time to catch it. 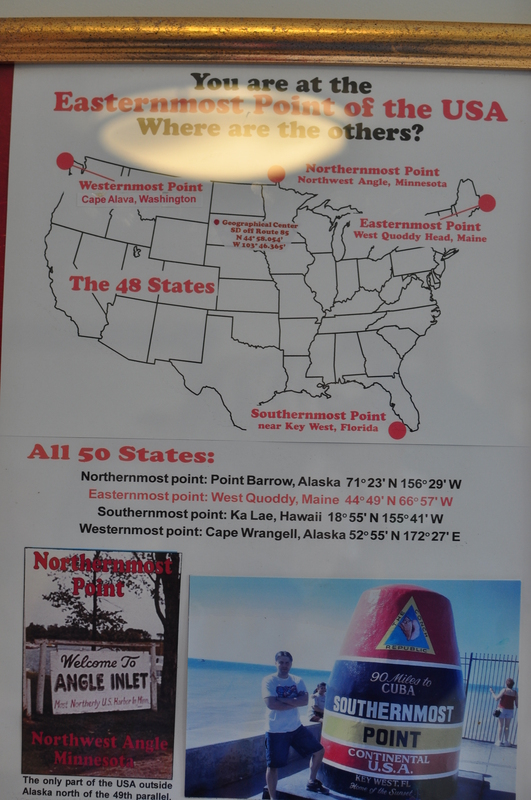 I think I mentioned that it is one of the first places the sun hits in the US. Fortunately, I could sign onto my MSN account on my phone, I IM’d my buddy Nick in Taiwan, and asked him to look up the sunrise time. Thanks to Nick, I learned that the sun would rise on Friday around 4:17AM (about 6 hours away). My plan was to hike up the mountain in time to catch the sunrise, and that would require starting the hike around 2AM. So I shut my eyes for a few hours, and around 1:30AM I began to make my way to the park. I was bummed initially as I could not find any trailheads for getting up the mountain, so I ended up just taking the park road to the parking lot at the summit. In hindsight this turned out to be a very good thing, as it was damn cold near the top. It must’ve been in the 40s with the strong winds blowing. If I had hiked, I would not have been prepared for the cold at all, nor would I have had my tripod to set up for some sunrise shots. I got a little rest in the car, and then before you knew it the parking lot was filling up. Around 3:30AM you can see a distant glow in the horizon, so I got out of my car to find a spot to watch from. It was cold, but there was a cool atmosphere on the summit with everyone excited to see these first few rays of the sun. Once the sun came up from the horizon, it seemed to rise incredibly fast, and before I knew it the day was bright. I was thinking I should try to post the photos showing the transition from early early morning to the sun appearing, but that could take a little bit. So I made a little slideshow showing the progression. Apropos, the music is from the soundtrack to the film “Sunshine” (one of my favorite movies). The track is entitled “Capa’s Last Transmission Home”. Catching this sunrise was an unforgettable experience. The crowds were dispersing, and after it was bright again I went to the car, removed my extra layers as I was already getting warm, and caught a little more sleep. Woke up around 9AM to do some hiking. Hiking down the mountain was easy, coming back up was a little strenuous, but enjoyable. 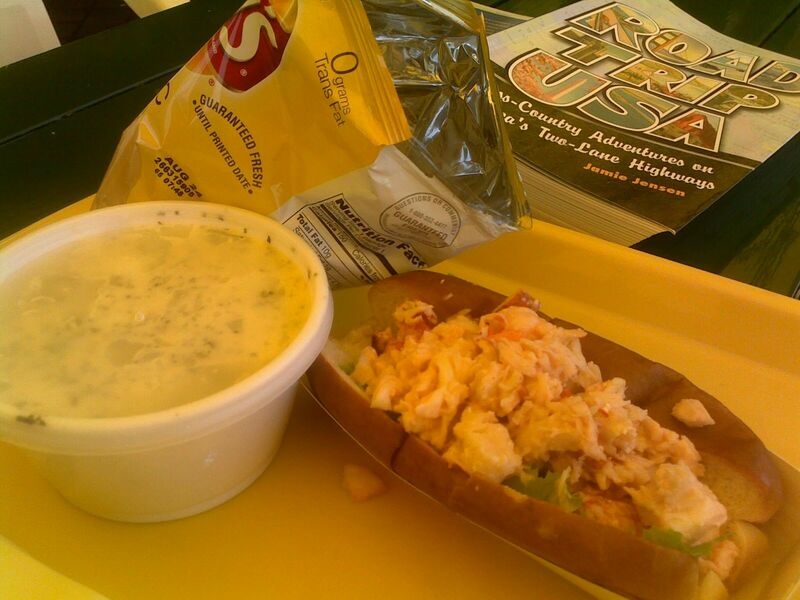 I had a recommendation from my friend Frances, along with one of my roadtrip books, to check out a restaurant on the other side of the park called “Thurston’s Lobster Pound.” I made my way over there to grab lunch, and I was not disappointed. I wasn’t hungry enough for a whole lobster (which was pretty cheap), but I ordered a lobster roll and it really hit the spot. 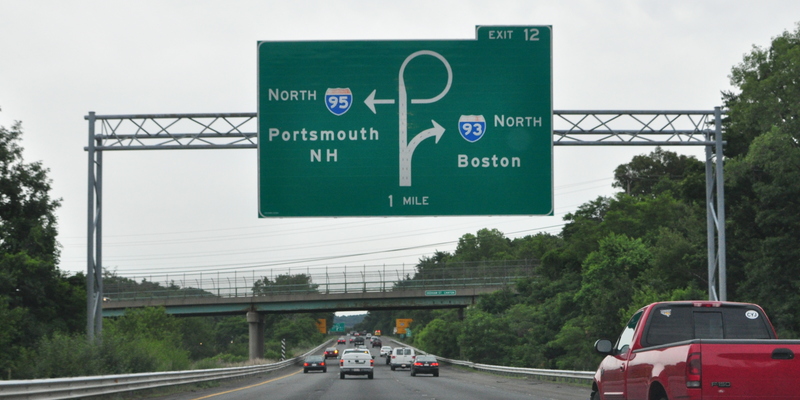 After lunch, the plan was to make my way to southwest towards Portland, Maine, where my friend Colleen lives. I’ve known Colleen for ages having gone to confirmation class with her, and she offered to put me up for the weekend. Had a great time lounging about not doing too much, met some of her friends, and ate some great food (and also witnessed the US World Cup loss to the “injury”-prone Ghana team). 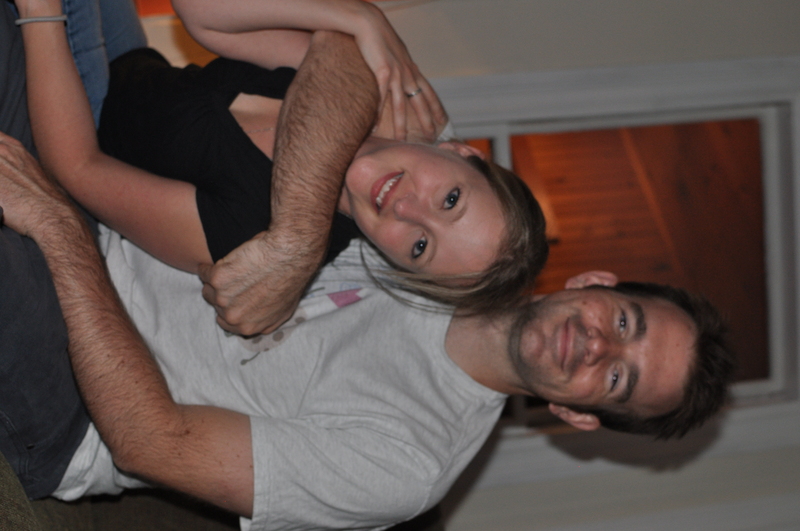 I also got some tips on places in Michigan to check out from her friends Jeff and Jen. Thanks guys. The fun night ended and I got some sleep as my break here will end and the roadtrip continues. The plan is to stick around in Portland until Sunday, and from there the journey turns West for the next several weeks. 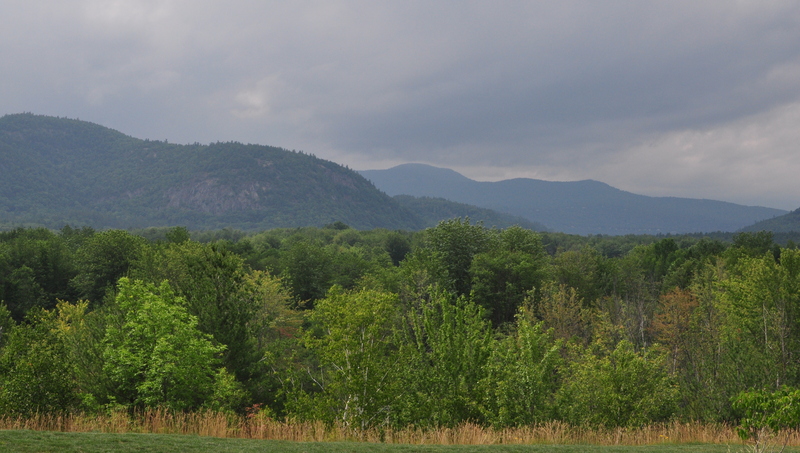 And as I type it is Sunday morning, and I’m fixin to leave here and work my way through New Hampshire and Vermont. Some shots from the weekend are below. 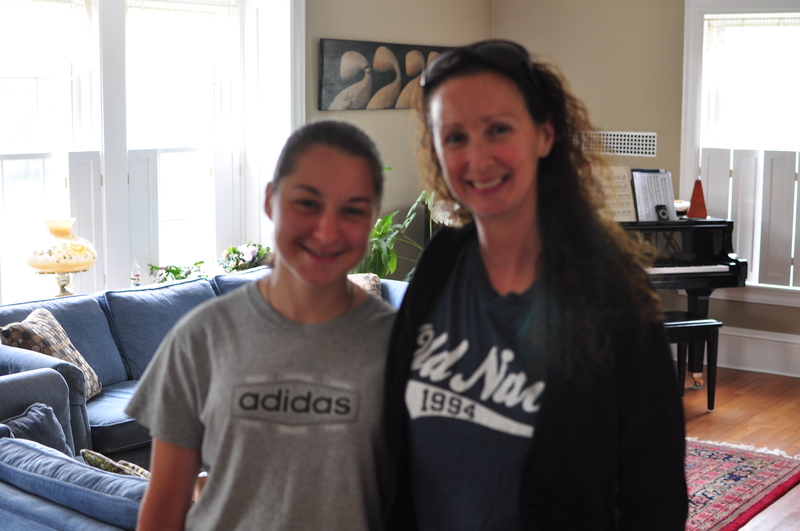 Thanks so much, Colleen, for hosting me. 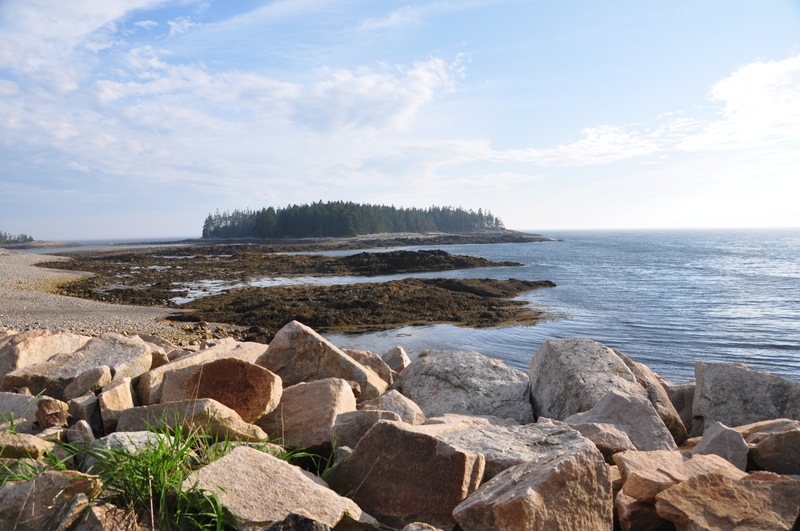 Portland, ME (the kids call it the “other Portland”) is a great place. Leaving Portland soon. So long, East coast. So before I went to bed at the Peacock House, Sue told me breakfast is served at 8:30AM. Late that night I realized I wasn’t sure what time zone I was in. My phone was on Atlantic Time, but the alarm clock in the room was on Eastern Time. Most people, I think, would side with the alarm clock that’s a part of the bed and breakfast, but I got a bit nervous and, at the risk of missing breakfast, I set my alarm for 7am Atlantic Time. Sure enough I saw Sue at 6am EST time, and she confirmed EST was the right time zone. Caught a few more zzzs, then got ready to eat. Delicious breakfast made by Dennis. 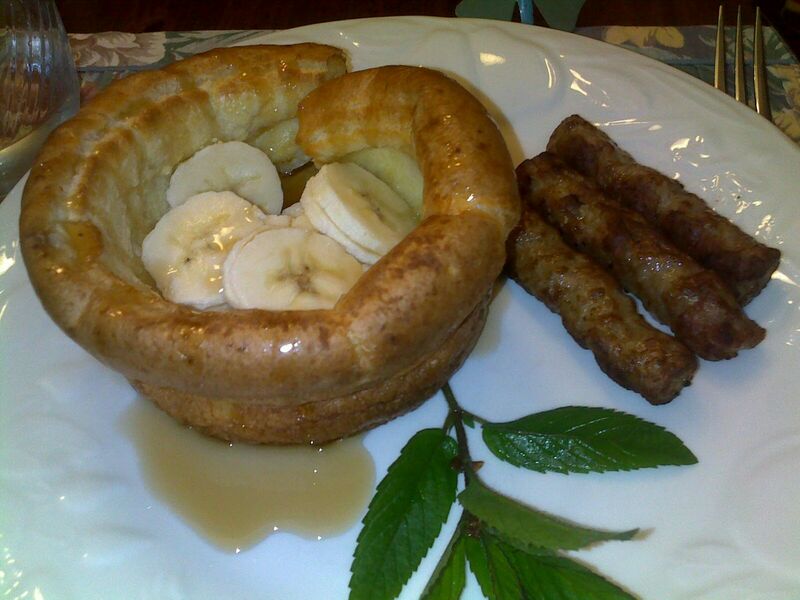 Not sure what you call it - French toast bowl? Over breakfast I got to meet Dennis, Sue’s husband and co-proprietor/chef of the b&b. I also got to know the other guests staying in the house, and learned about some of the local attractions from them and Sue. This is exactly one of the best parts of being out on the road – getting to meet new people and learn about the places they visited. If you are ever on the east coast of Maine and need a nice place to stay, I can’t recommend this place more. Check out their site here. Thanks to all of these kind folks for recommendations on things to do that day. 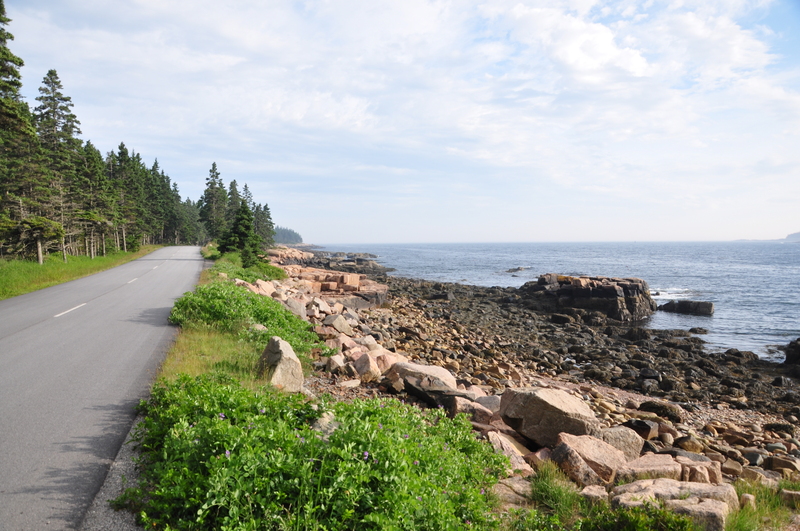 My initial plan was just to head south to Acadia National Park that morning, but after talking with everyone, I lined up good amount of activities through the afternoon before I would make a drive of any big length. 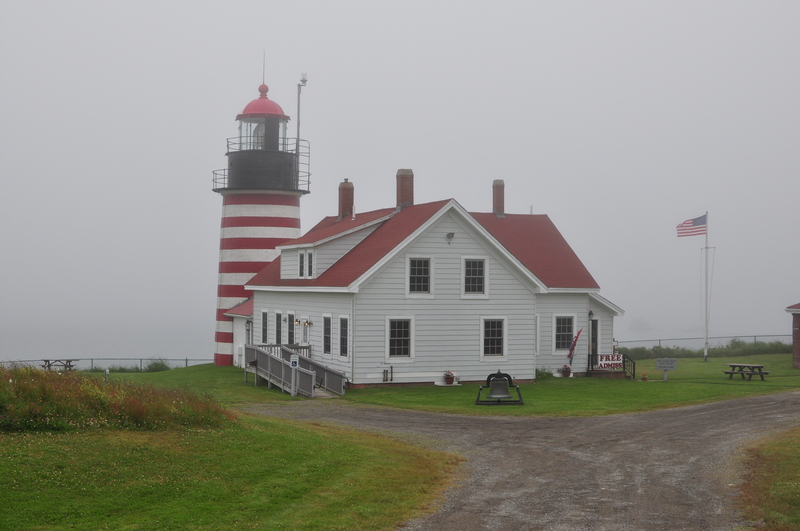 First stop – the West Quoddy Head lighthouse on the easternmost part of the U.S. So I found the origin of that fog horn I was hearing the last night before I went to sleep. There’s a small building right next to this lighthouse that houses the horn. It’s loud, but it’s a strangely soothing sound. 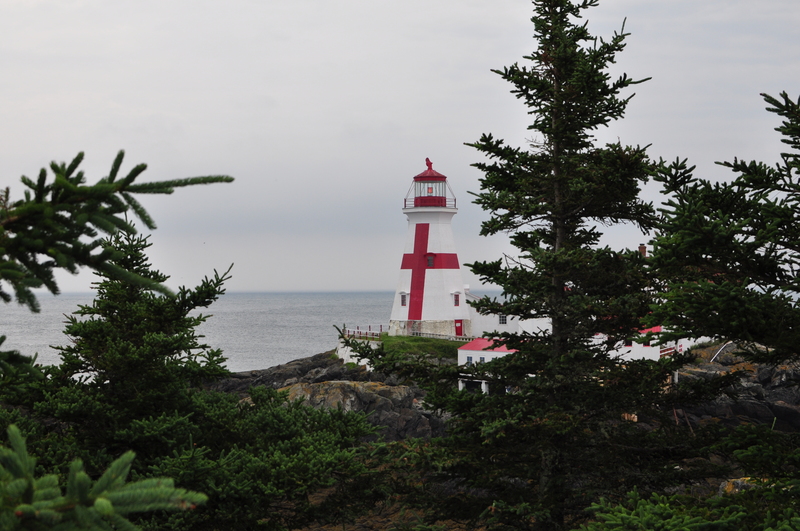 Ran into Chris and Jennifer at the lighthouse, and ended up taking a stroll along the water. 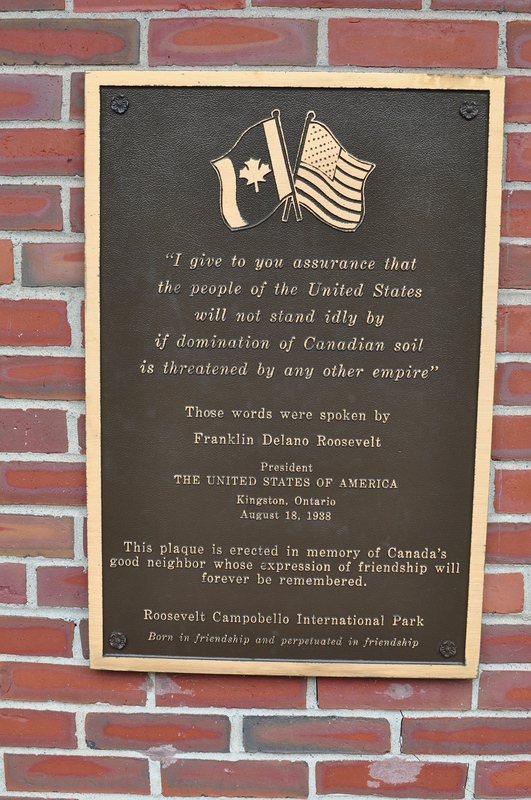 The next item on the agenda was to visit Franklin Roosevelt’s summer home on Campobello Island in New Brunswick, Canada. It wasn’t a far drive at all, and I made it through Customs without incident. 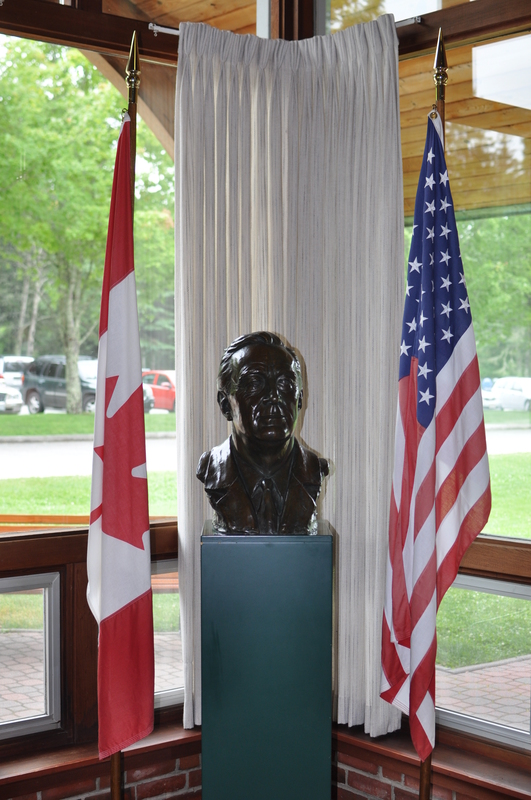 I didn’t even know FDR had a summer home, let alone one in Canada, so I checked out the visitor’s center to learn more. Thanks to my friends at the b&b for recommending the free film – it was well done and explained why the Roosevelts had a place here. 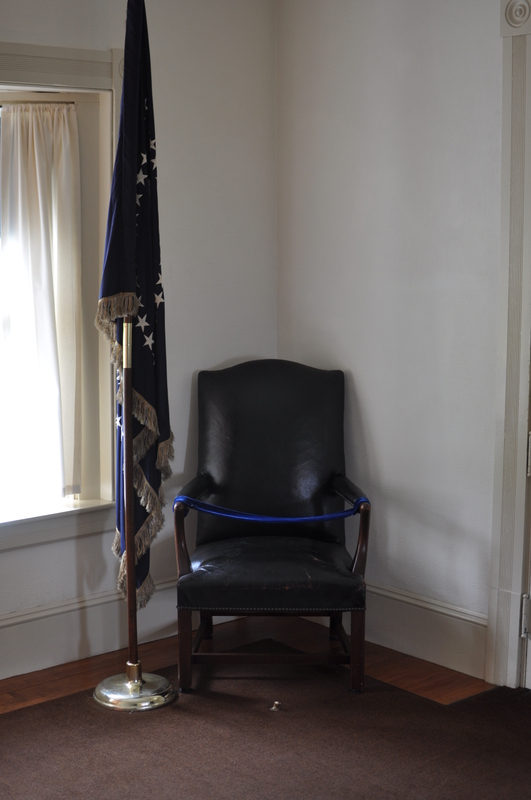 The visitor center was also great at explaining American/Canadian relations from early colonial days to modern times. Fun fact: US trades more with Canada than all of the countries of the EU combined. 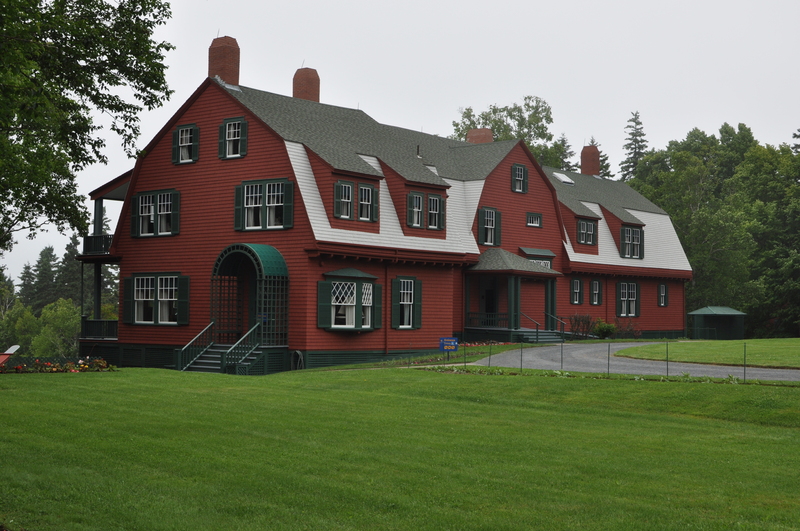 The visitor center was right next to the summer home, so I spent some time wandering the grounds and exploring the inside of the home (gorgeous, by the way). 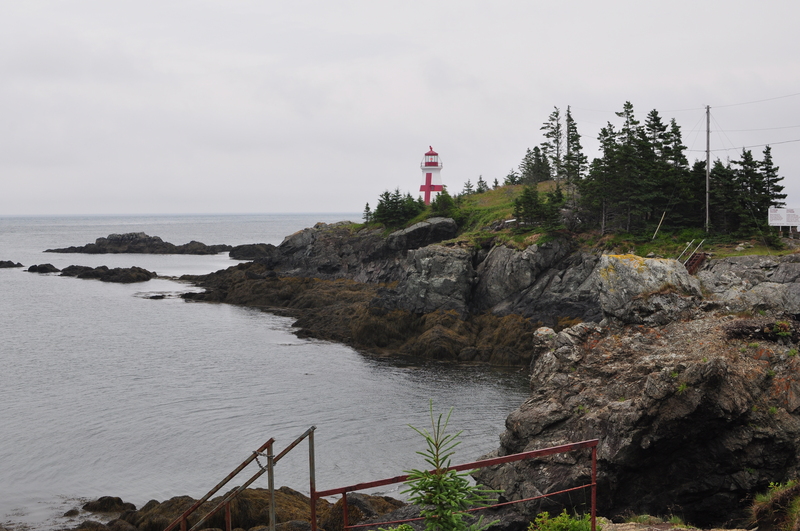 After some sightseeing, I left the grounds and made my way North towards the East Quoddy Head lighthouse. 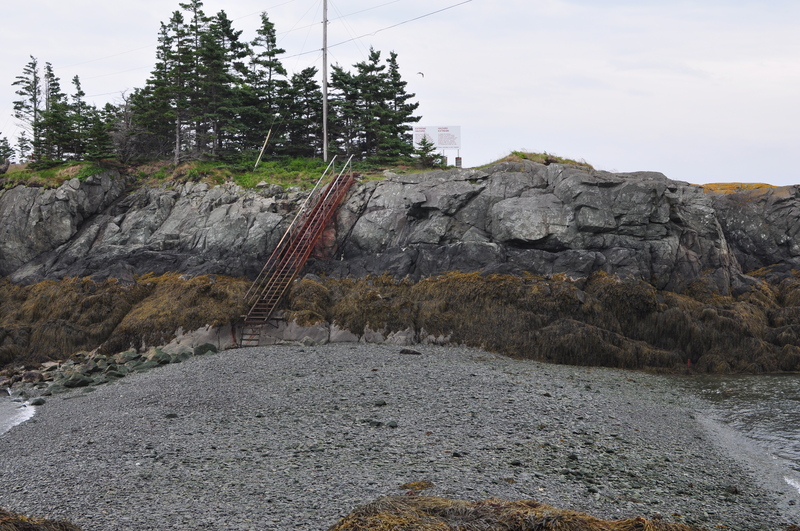 I was informed earlier that, when the tide is out, I can walk across the ocean floor and make my way to the island of rocks that the lighthouse sits on, and around 3:30PM would be the time the path would be clear. I got there around 2:45, took a nap, and then started the mini-trek towards the lighthouse. 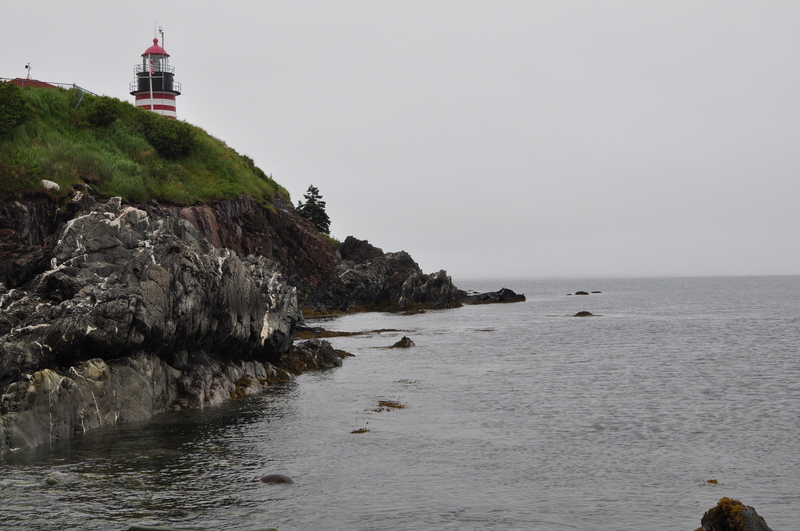 You had to make your way across one small island first, then cross the seabed one more time to get to the lighthouse. Wonder what it looks like when the tide is in? Finally made it over! 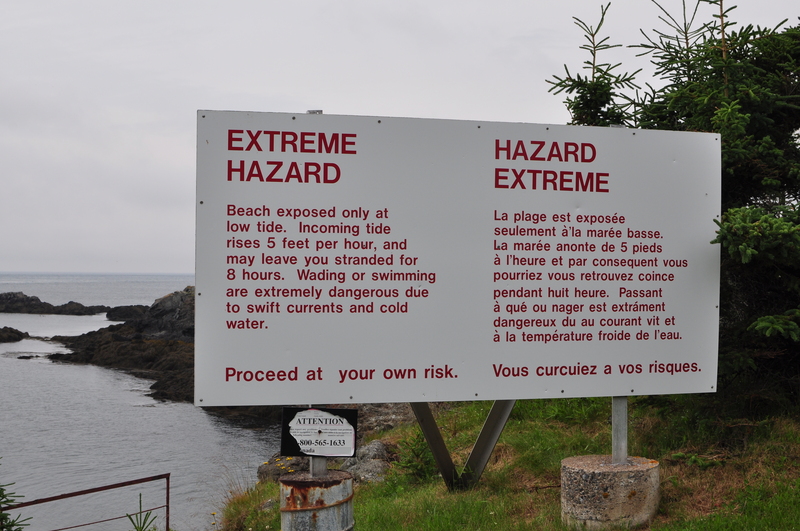 It was a fun time – not often you can walk across the ocean floor. Hiked my way back to the car, grabbed some fried shrimp at a local restaurant (happened to catch Chris and Jennifer again as they were headed out), and then headed back towards the US. Not sure if I was randomly selected, or if it was all the junk in my car, but I had my car searched at Customs. 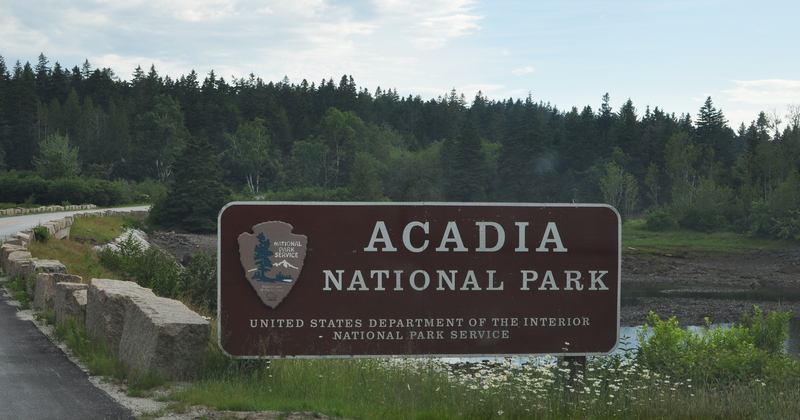 Fortunately no problems, and then got onto Hwy1 to head Southwest towards Acadia National Park. 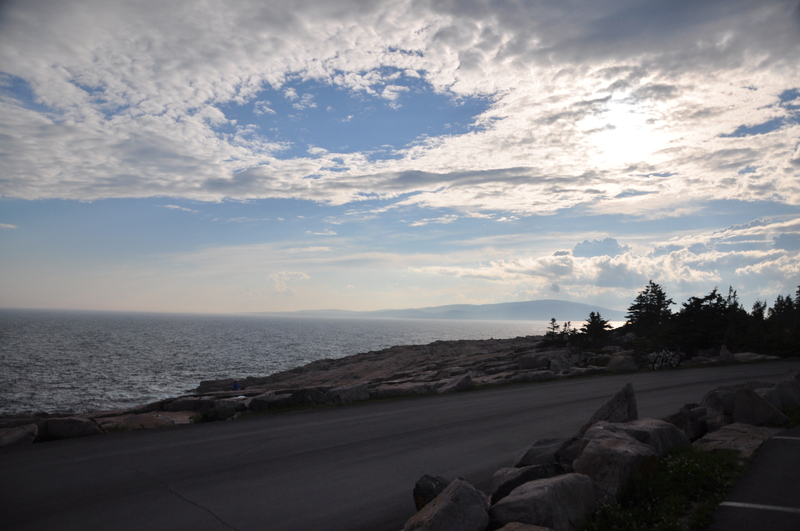 Arrived at the Schoodic Peninsula potion of Acadia a few hours later. 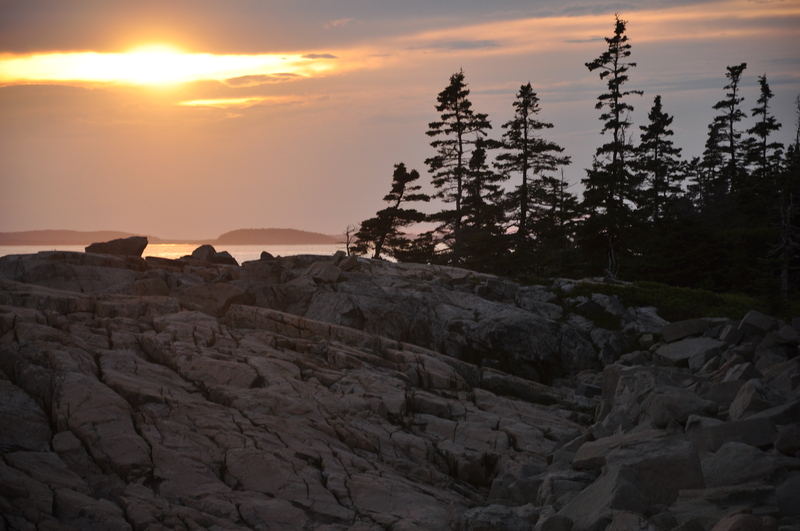 For years I had wanted to visit Acadia, and now I was finally here. And what timing – finally, the clouds of the past several days were breaking, and I could actually tell where the Sun was. How lucky I was to arrive here just as the sky was clearing up. 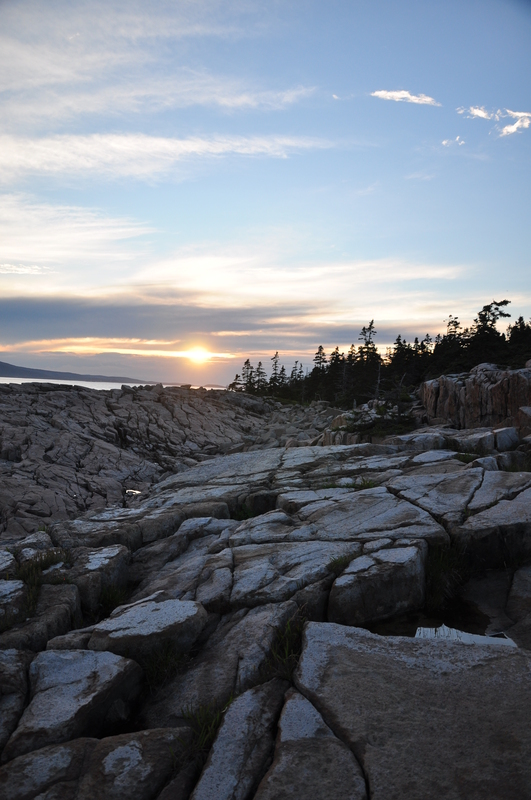 Acadia is absolutely beautiful. 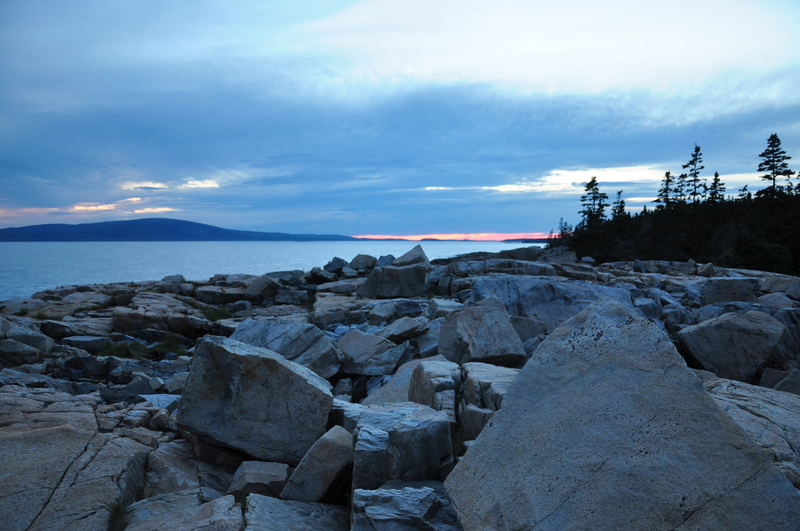 I made a few loops around the Schoodic peninsula portion of the park that night. 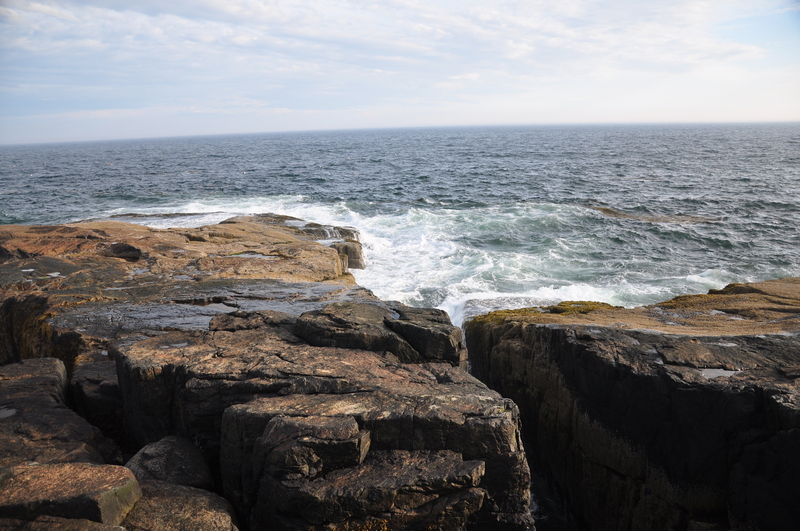 I decided I’d hang out by the Schoodic Point area for a while and just enjoy watching the waves hit the rocks. The sun was coming down, and I figured it would be a good way to end the day. 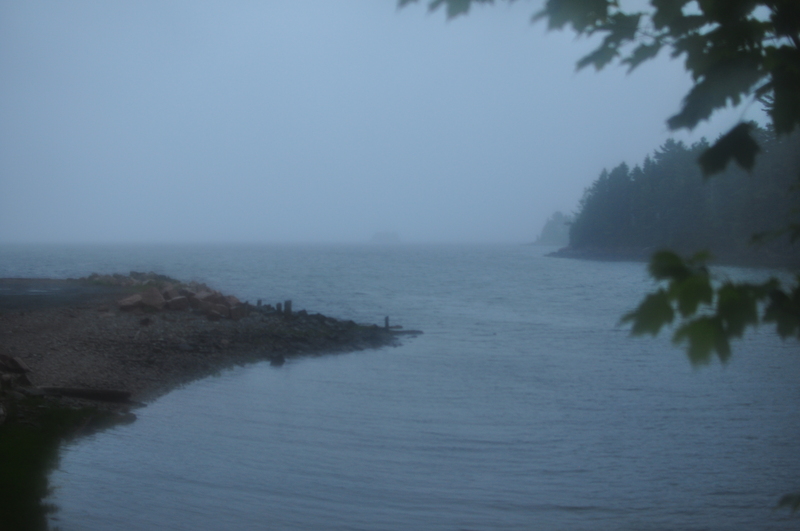 I drove to nearby Bar Harbor, Maine, to get some sleep for a few hours. 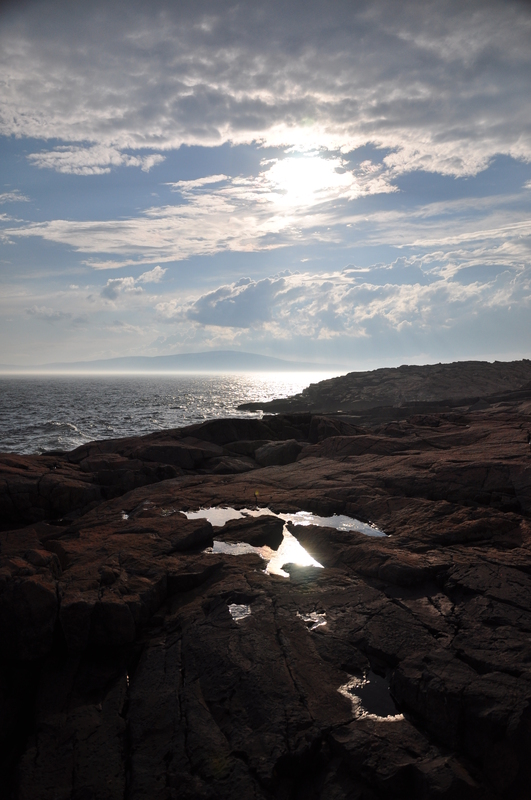 My goal was to catch the sunrise from Cadillac Mountain, where it is said that some of the first light of the sun hits the U.S. 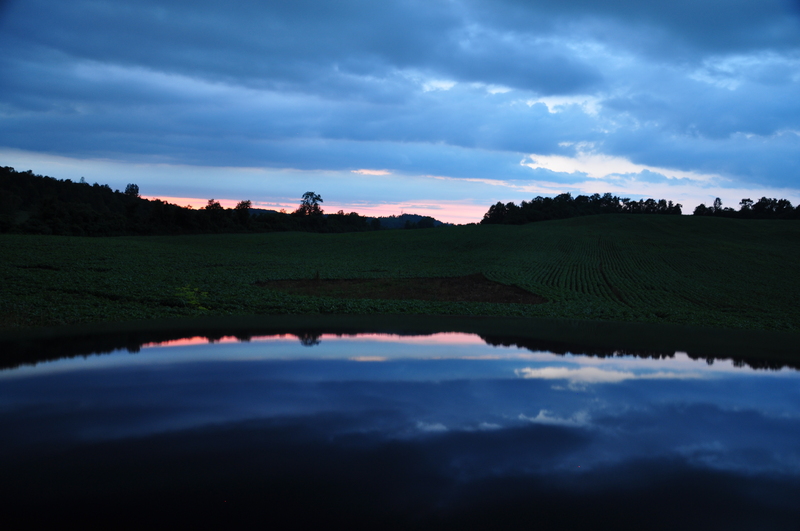 Thanks to Nick for finding the sunrise time for me – 4:17AM. Early day, for sure, but it’ll be worth it. 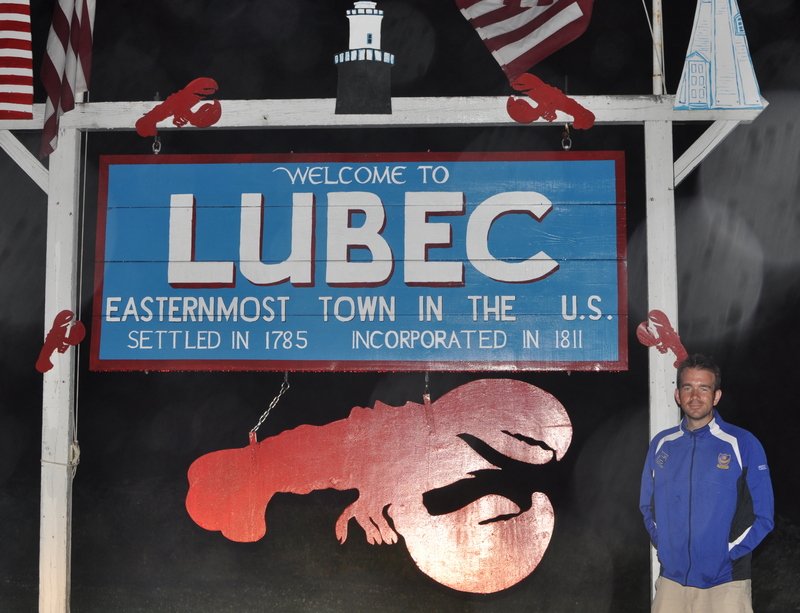 Greetings from Lubec, Maine – the easternmost town in the whole country. 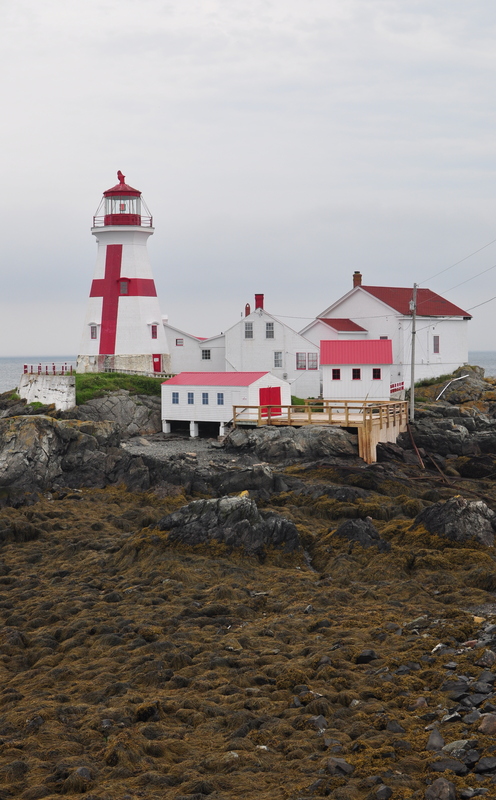 I had heard about this place from my friend Frances, and though I didn’t have intentions of visiting, it was right along the coast and I figured it would be worth a visit. And since I arrived after 9PM and over 300 miles of driving today, I decided to find some place to stay. Thanks to 3G on the phone, I found the Peacock House Bed & Breakfast, and the kind owner Sue checked me in after normal hours. Where to begin? 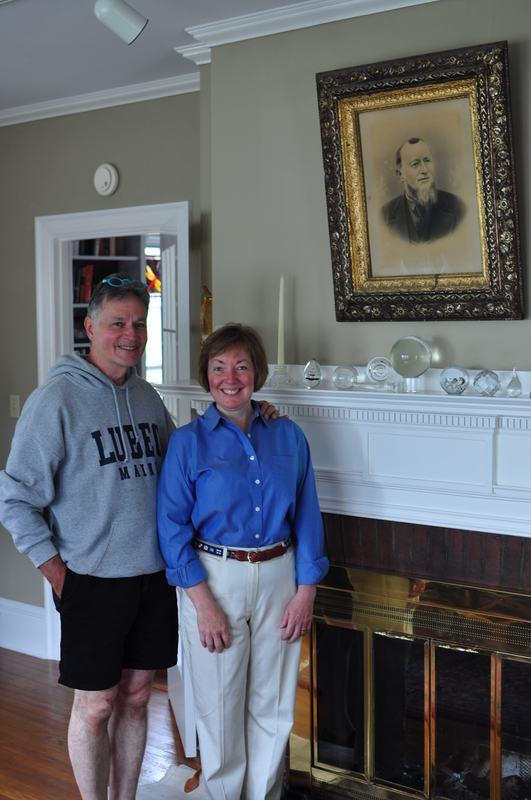 In my last post, I described the time I spent with Lynn and my other relatives. The following morning (Tuesday) I accidentally slept in, but it turned out to be OK. Lynn didn’t need to kick me out, and I didn’t necessarily have to be anywhere (story of this trip). So I got caught up on my website posts, tallied the latest expenses, and took care of some laundry (thanks, Lynn). 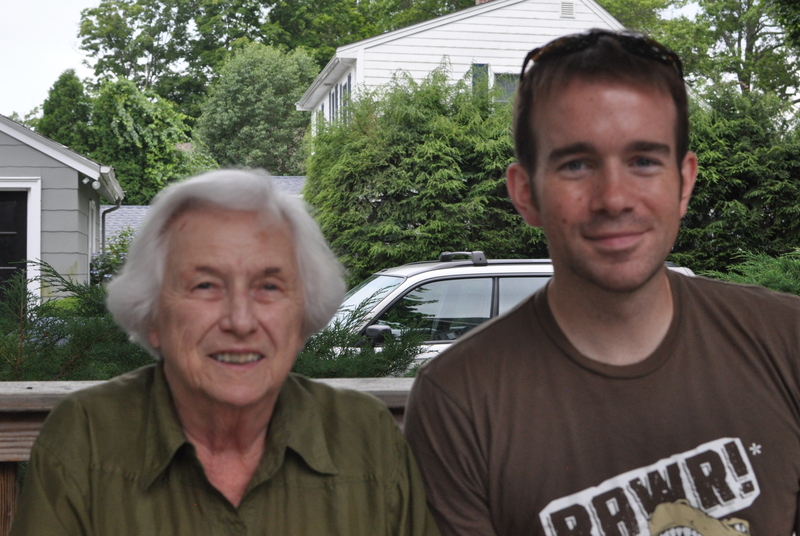 Around 4PM or so, we headed to the Barrington, RI area to visit my great aunt Vivian (Viv was the wife of my great uncle Omer, one of the three brothers previously mentioned). At 88 years old, she is the oldest remaining relative on this side, as far as I know, and still lives in a house that was owned by my great grandmother’s family (Pere’s). If I met Aunt Viv before, it was when I was little, so I had no memory of it – but she treated me like someone she’s known forever. We enjoyed some drinks and snacks outdoors, and I learned some more family history in the process. Another great visit with a relative. 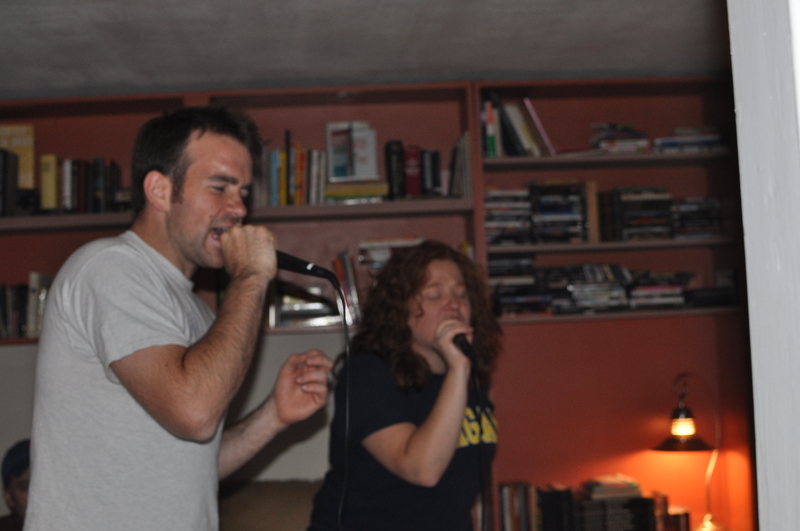 My only regret with this whole stay in Rhode Island is that I haven’t spent more time with these people in the past. I said my goodbyes to Lynn and Aunt Viv, and got in the car to start the journey north towards Maine. I had debated stopping in Boston (never been before) and checking out some of the historic sites, but wasn’t drawn to it enough to fight traffic in a big city. 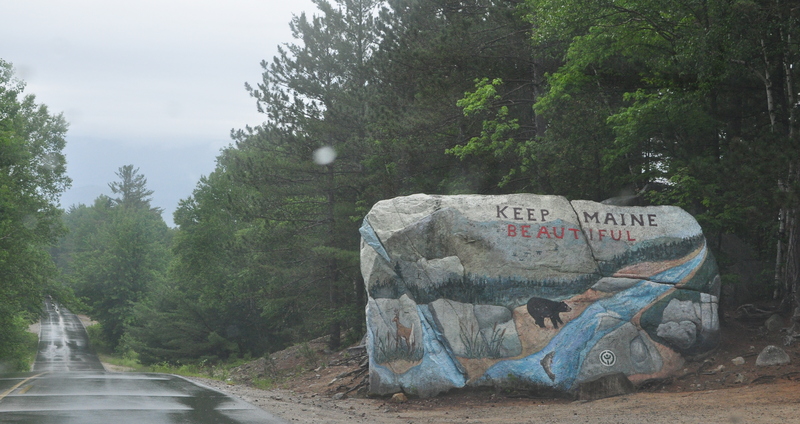 I had no major destination in mind for the day, but I just wanted to work my way towards northern Maine. 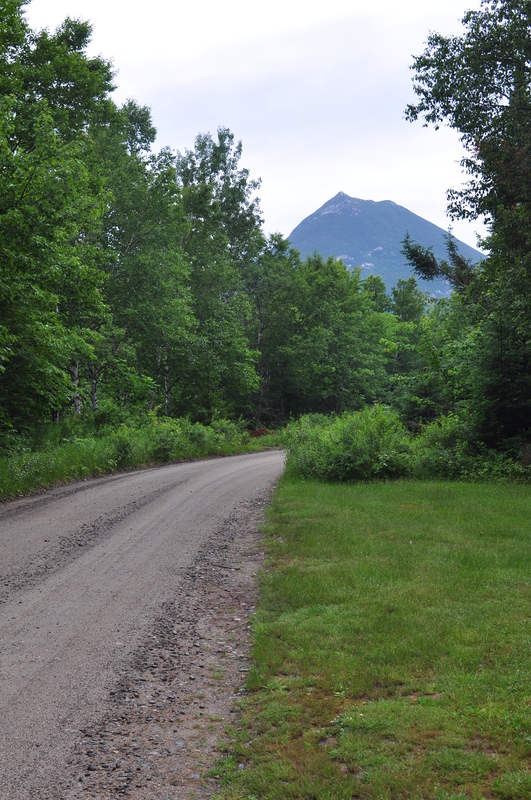 There’s a state park – Baxter – that marks the northern end of the Appalachin Trail (goes from Georgia to Maine) with the tallest mountain in Maine – Mount Katahdin. I was pretty thrilled to be in Maine. 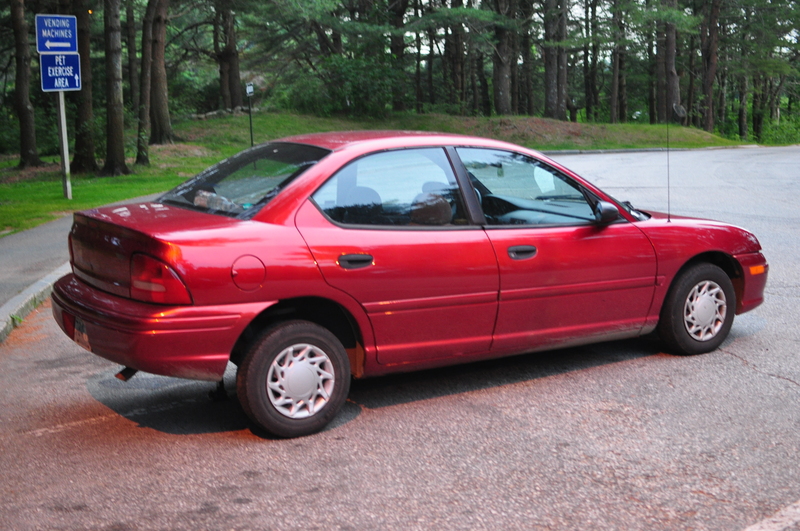 As I texted some friends, here I was 4,000+ miles since starting the trip, in a state I’ve heard so much about but had never seen.In the visitor center parking lot, I saw a car propped up on a jack but nobody was around it. Since it looked like my old Neon (just red instead of green), I gave it a look over. Someone apparently got a flat and got towed to the stop and hadn’t been back yet. I emphasized a little bit with the owner, knowing some of the issues you could get with that kind of car (though I had wonderful luck on my last roadtrip).Wonder if this car owner was on a roadtrip of their own? 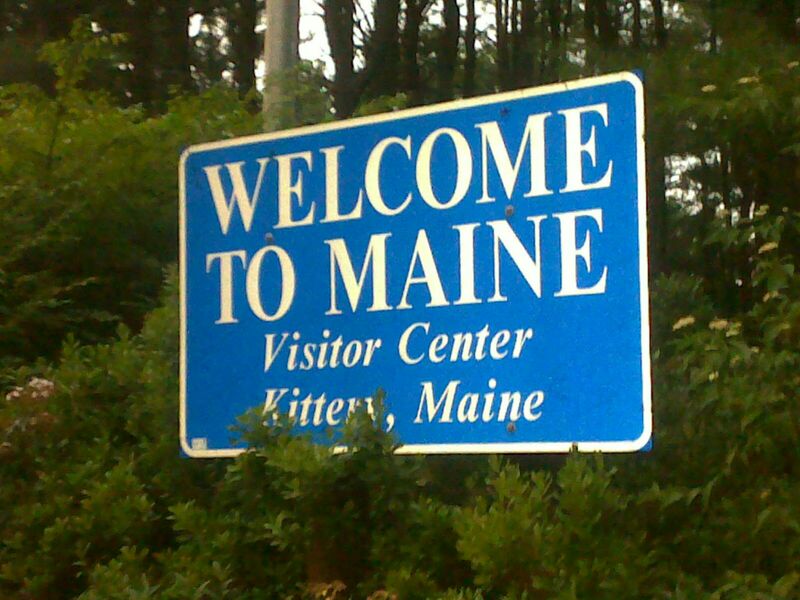 I drove my way to a rest stop not far from Millnocket, Maine. It was too bad the sky was overcast. I was thinking out in the Maine wilderness, with little city light interference, I bet the night viewing is spectacular. Oh well. 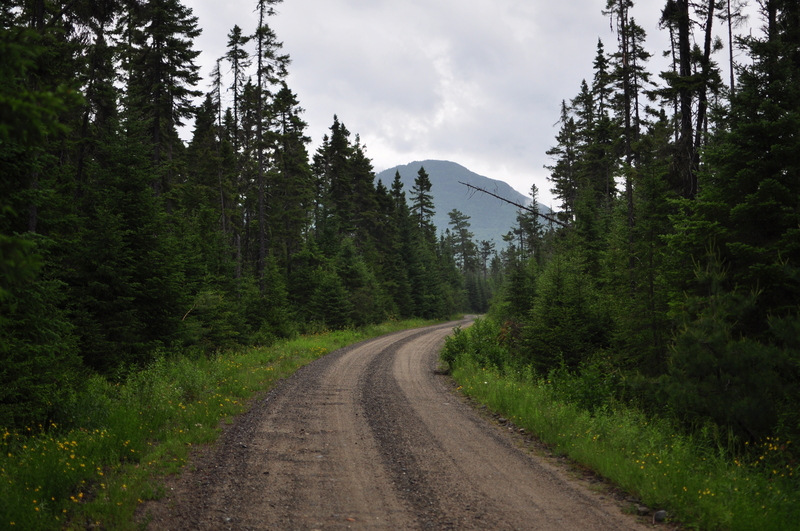 Slept at the rest stop and got up around 5AM to start the trek to Baxter State Park. 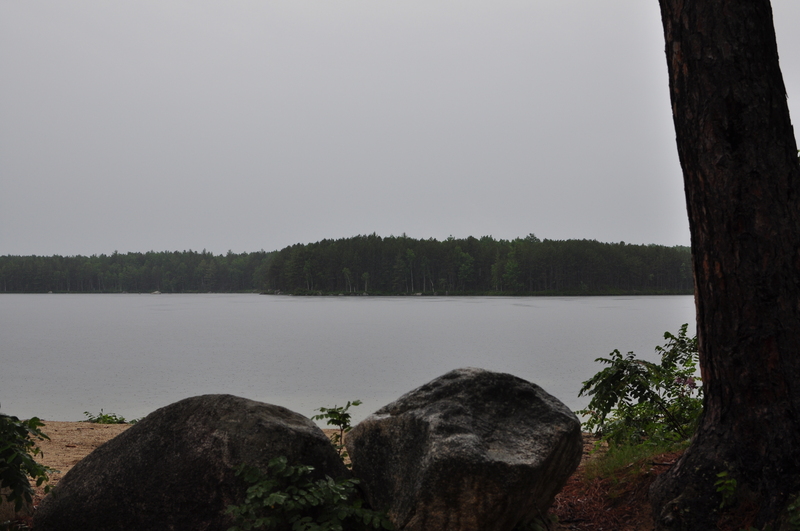 Unfortunately, the sky was overcast still, and rain was coming down periodically. 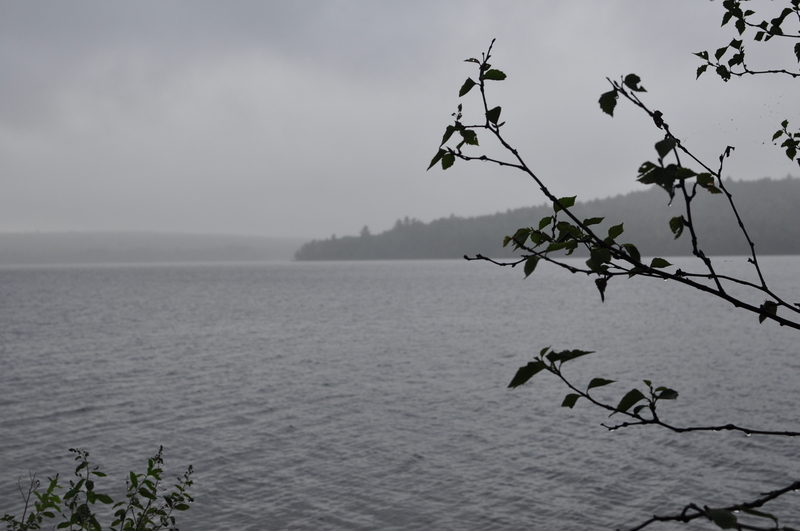 By the time I made it to the park, the rain was pretty steady and my chances of hiking near Mount Katahdin looked dim. 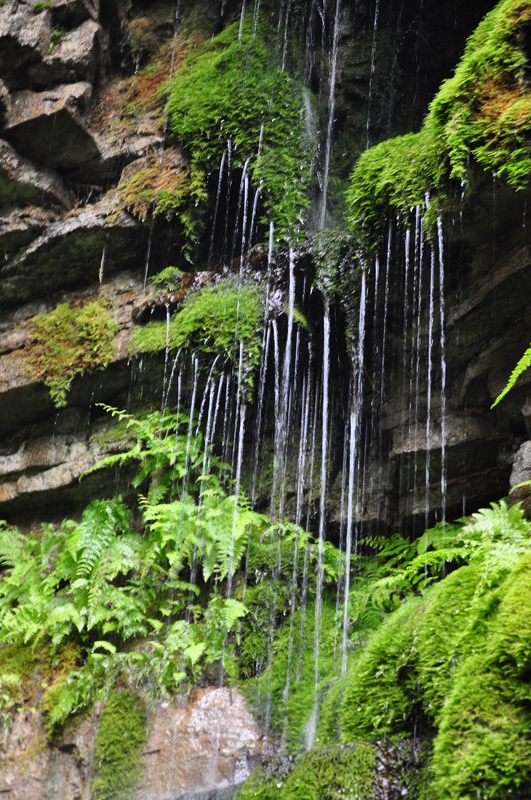 I don’t mind a little rain, but it seemed by the time I would make it back to the car after a hike, I’d be soaked, and I have little room in the car for wet items. 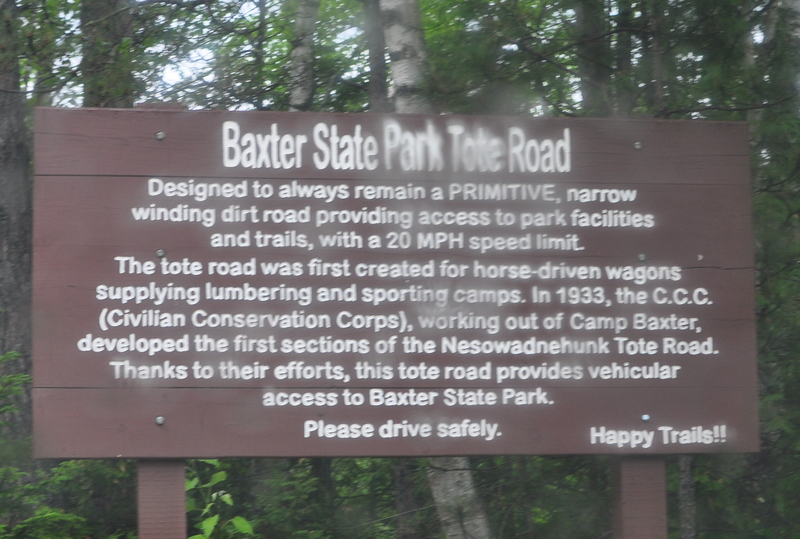 But I still got to enjoy the park via the “Tote Road”, the unpaved main road that winds through the park. On this road, the max speed limit at any point is 20 mph, and you have to watch for cars as the road is barely wide enough to fit two across. 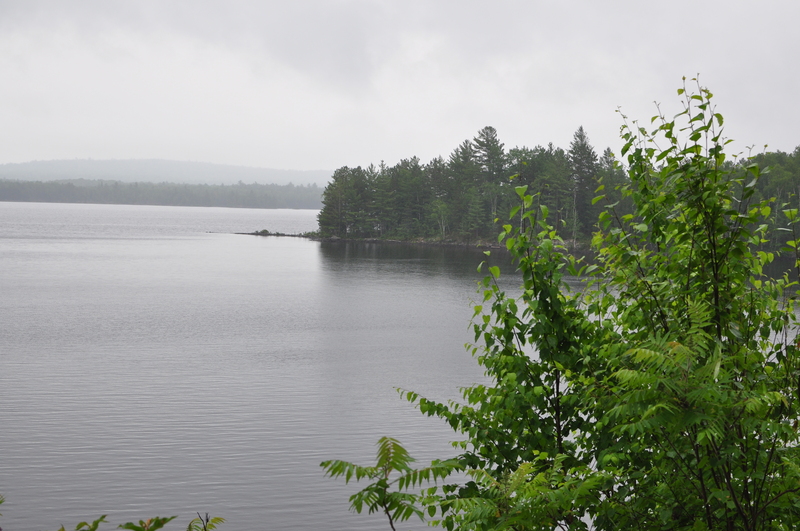 Maine is famous for its twenty-five hundred miles of seacoast, with its countless islands; for its myriad lakes and ponds; and for its forests and rivers. 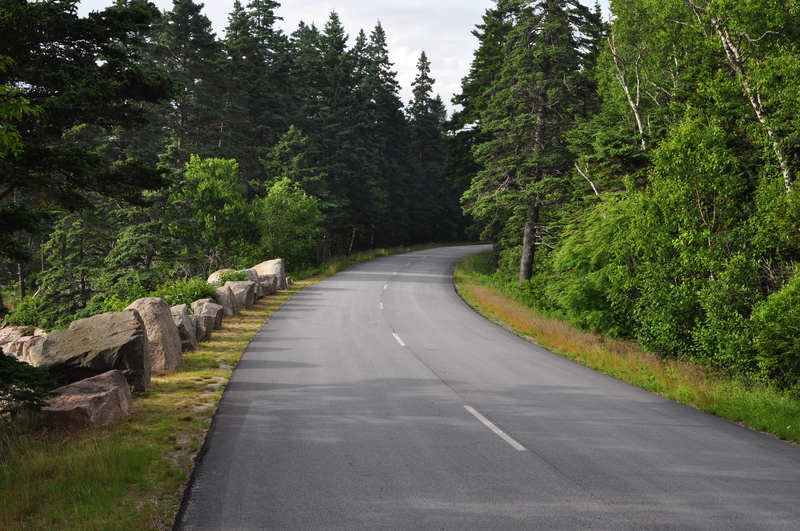 But Mount Katahdin Park will be the state’s crowning glory, a worthy memorial to commemorate the end of the first and the beginning of the second century of Maine’s statehood. This park will prove a blessing to those who follow us, and they will see that we built for them more wisely than our forefathers did for us. It took several hours to get through the park between driving at 20mph and stopping for naps/photos. 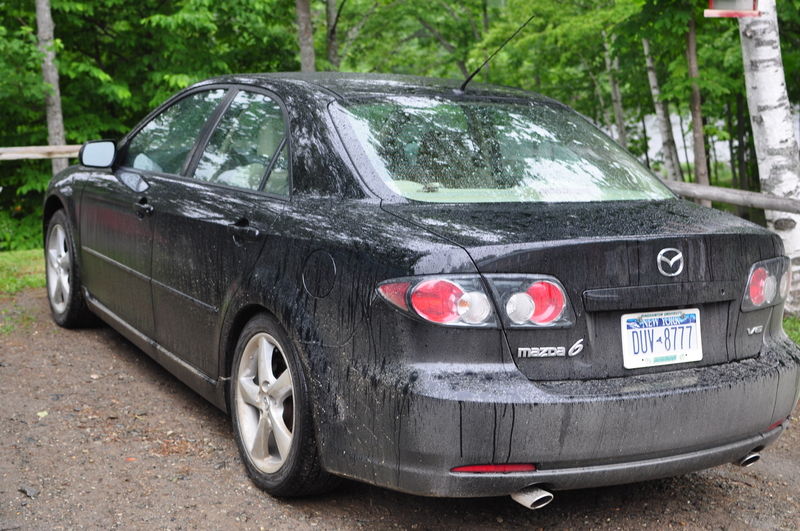 By the time I made it out, it was still raining and the car was quite a mess. 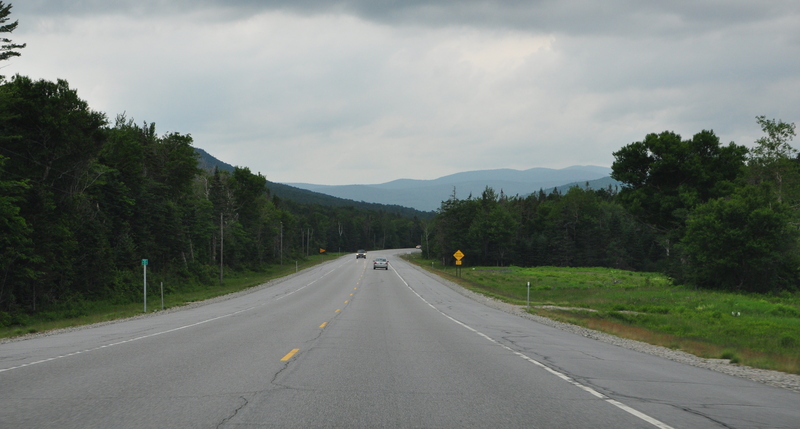 I continued on some state highways, with some stops in some old towns, and made my way towards the eastern portion of Maine along Highway 1. At one point I reached a junction where Highway 11 went North and South. I pulled over, and texted my friend Kelly. “Which way?” I asked. She said “left”. Left was South, and left I went. 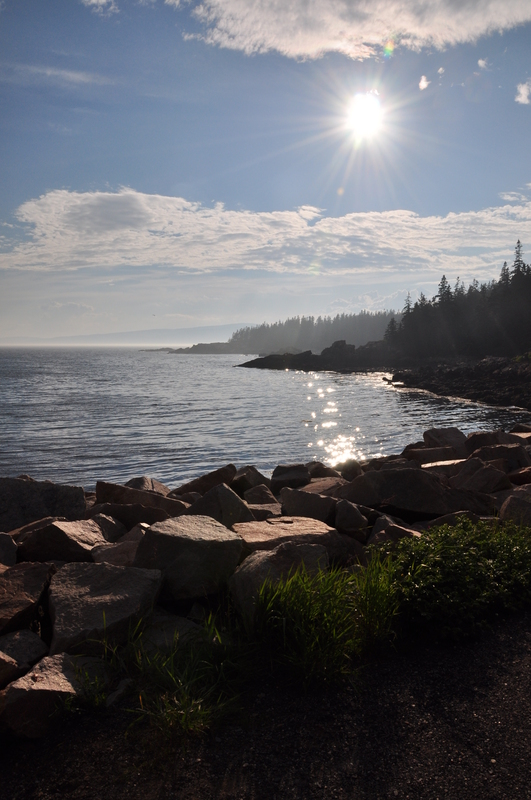 Originally I had made plans to go visit Nova Scotia, but it would be quite a haul to get to Halifax, and it would limit my time at Acadia National Park, so I decided against it. 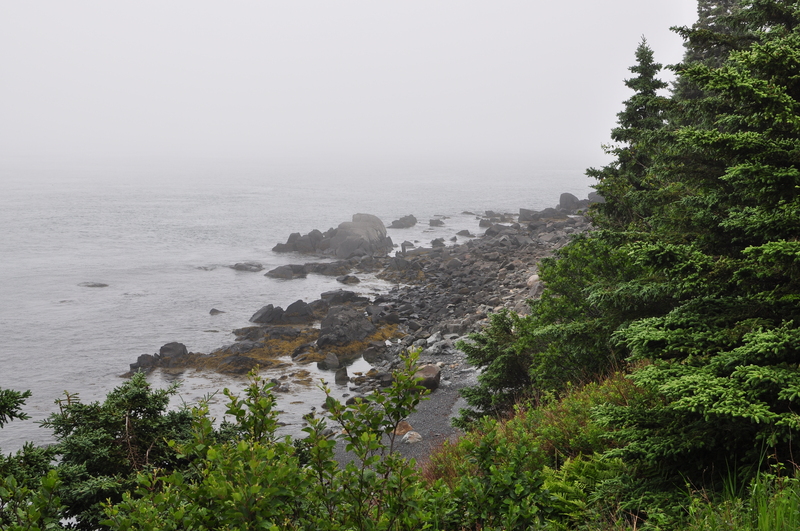 It certainly was chilly with the combination of driving near the water and the steady rain, and as I made my way towards Lubec I had to be careful as there was a little fog on the roads. 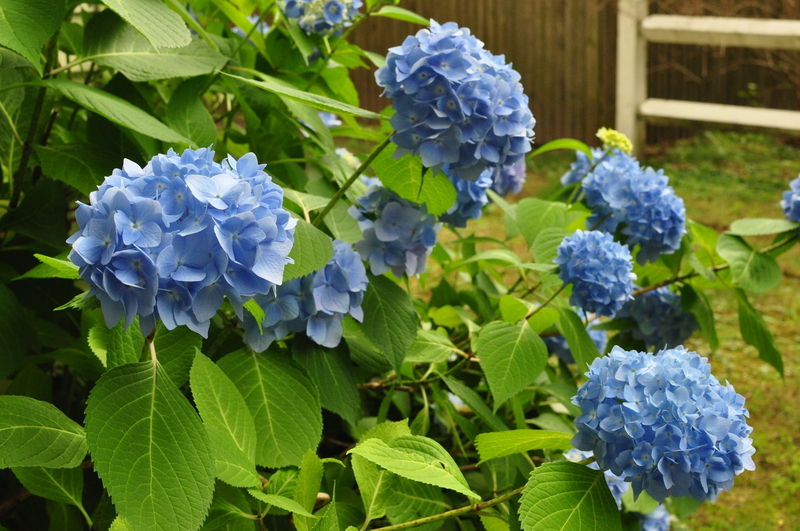 But even with the cold, damp weather, I would consider this an outstanding day. I covered a lot of ground, saw some beautiful places in Maine, and wound up staying in a bed and breakfast that was once a home built before the start of the Civil War (built in 1860). Sue says breakfast is at 8:30, and there she said I’ll learn more about some nearby attractions (and one in Canada). She said they are must-sees. Looking forward to it.